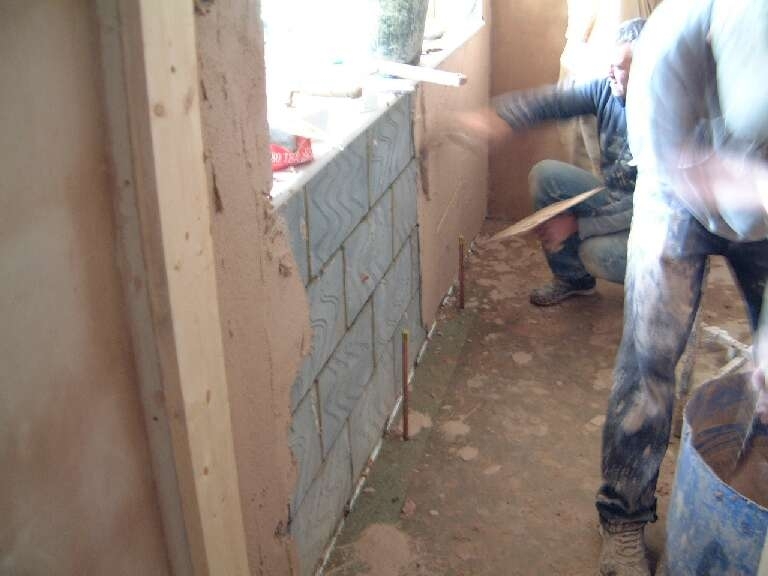 Day 43 – 16-05-03 Showers. 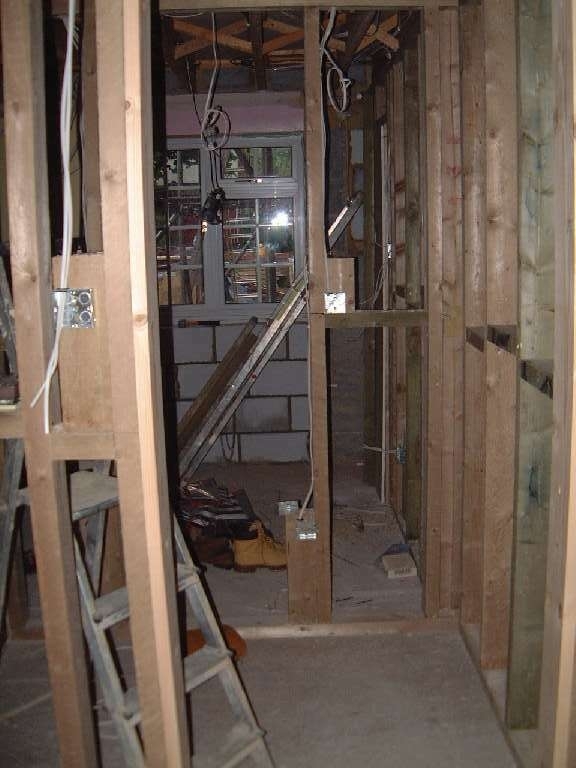 Busy day with electricians & chippies. 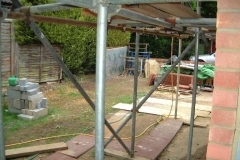 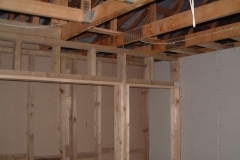 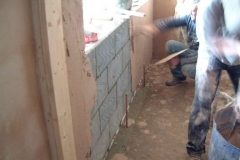 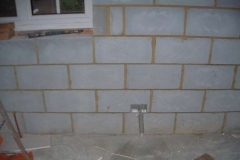 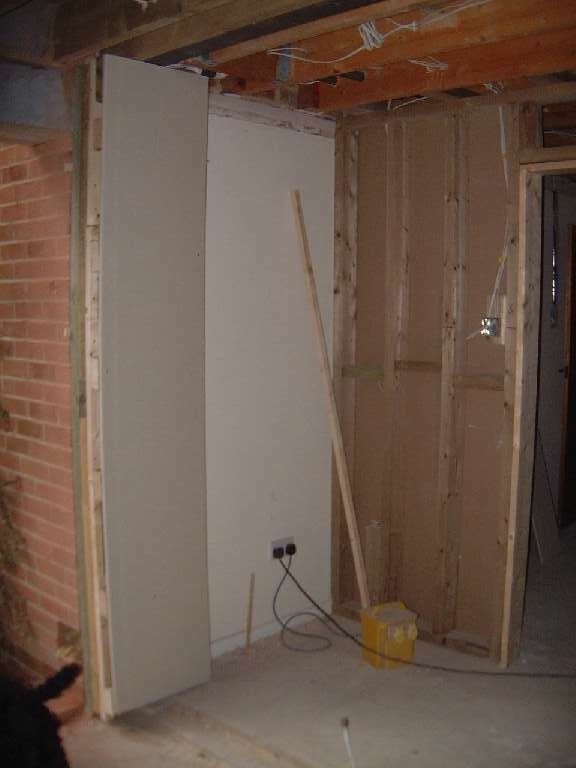 Most of the studwork has now been completed including the building of the fitted wardrobes. 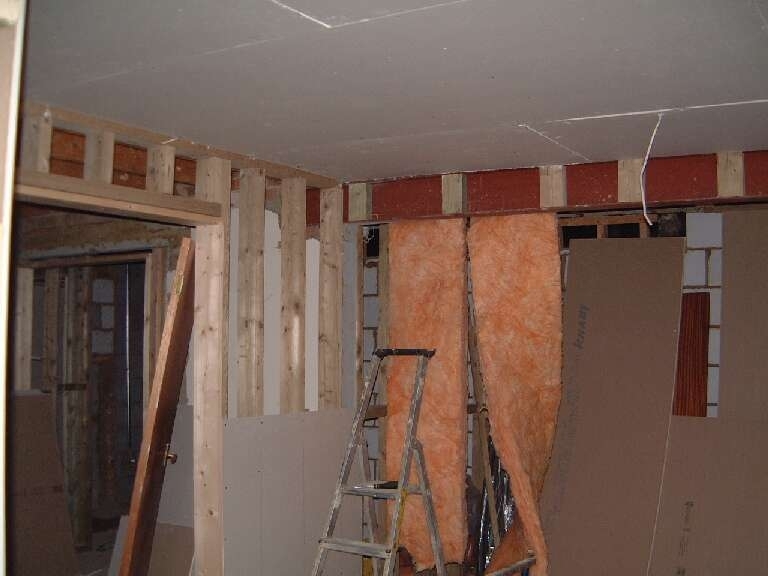 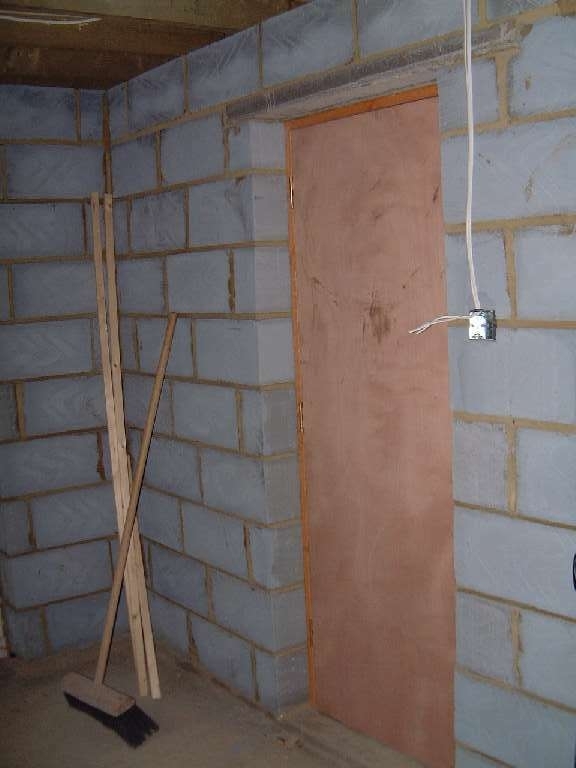 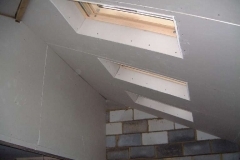 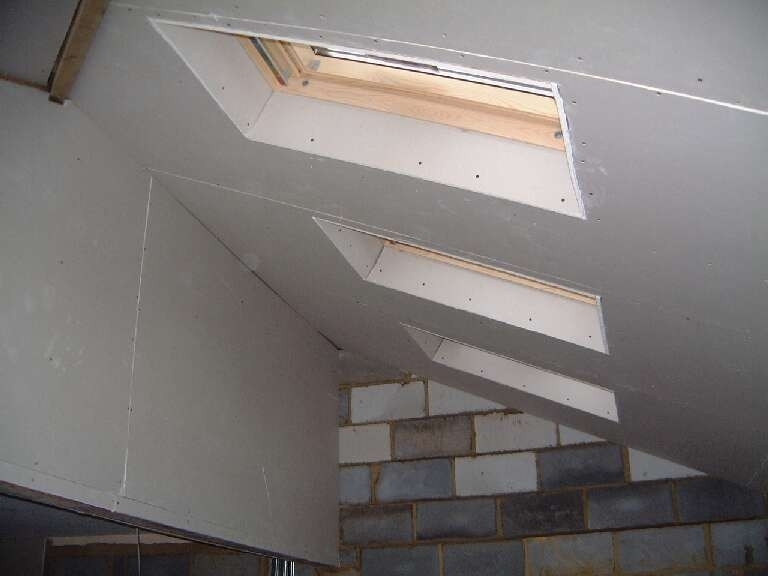 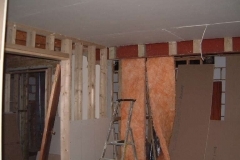 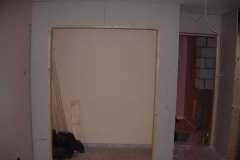 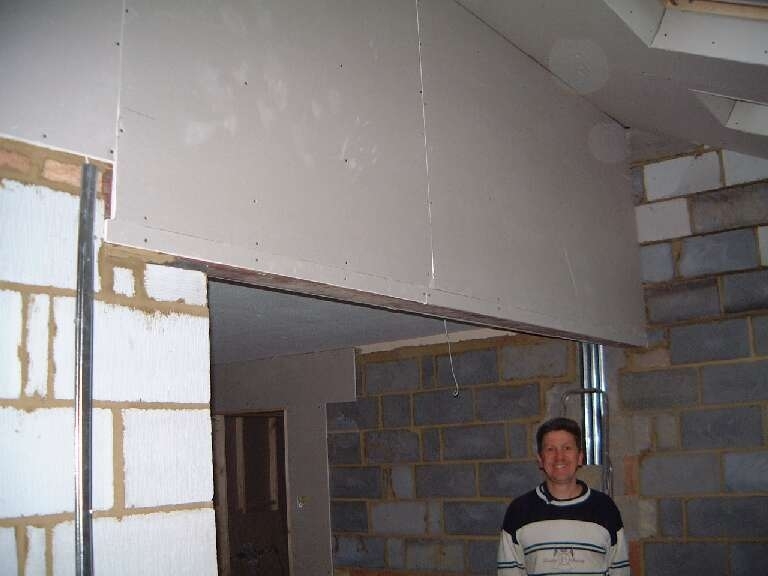 The plasterboard was also put up where possible upstairs. 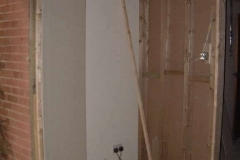 Bill presented us with a bill for the extras allowing us to ‘ponder’ over the weekend – our overall feeling was that he had not consistently told us what was extra. 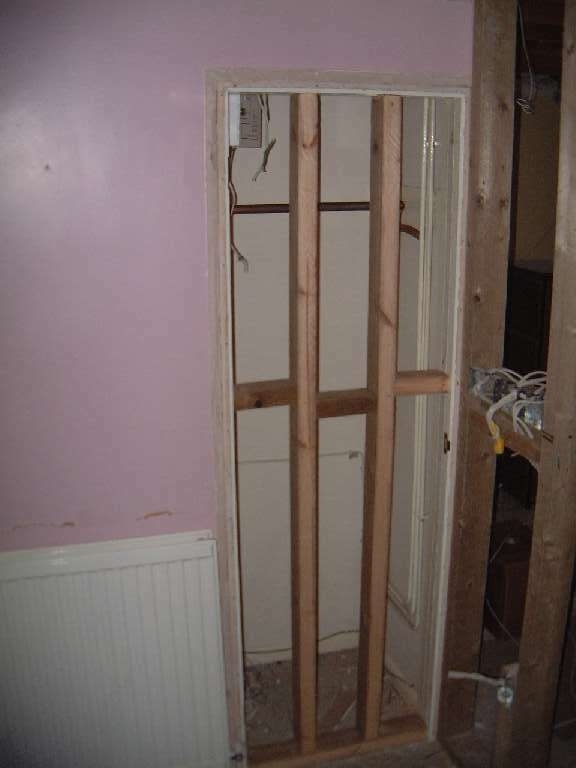 We do not feel that Bill is trying to overcharge us just a little shocked with the number of charges. 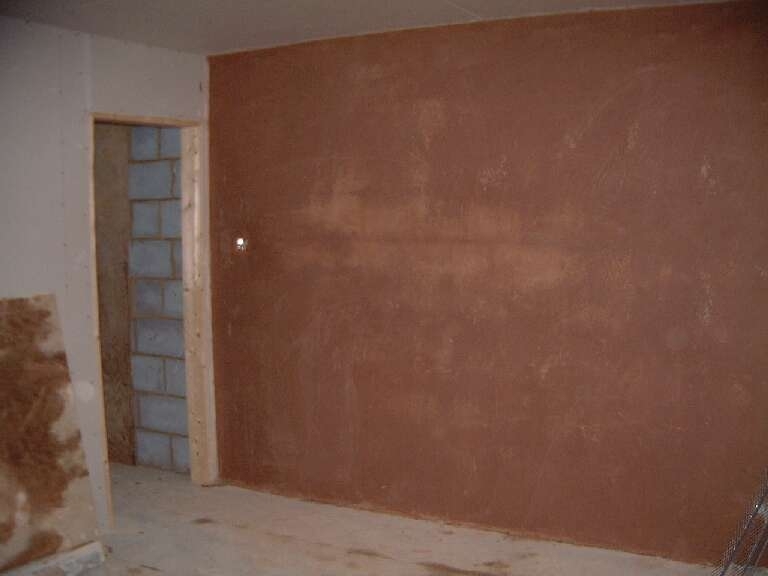 As the plasterers will be coming next Wednesday there will be another stage payment necessary. 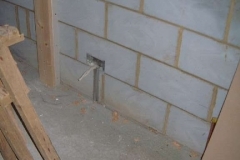 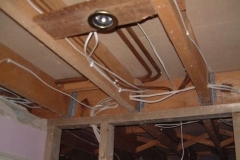 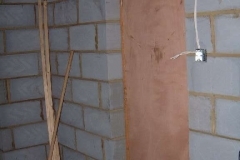 An electrician also spent Saturday morning completing the cables. 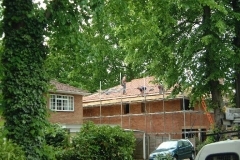 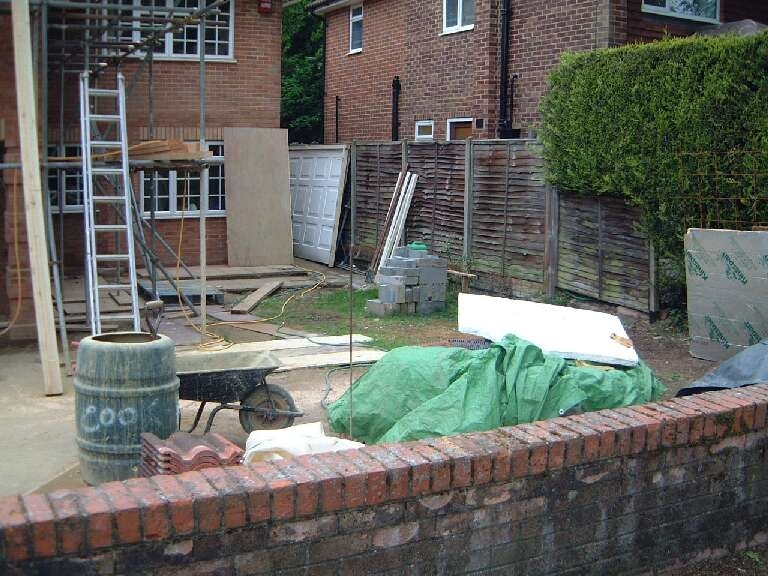 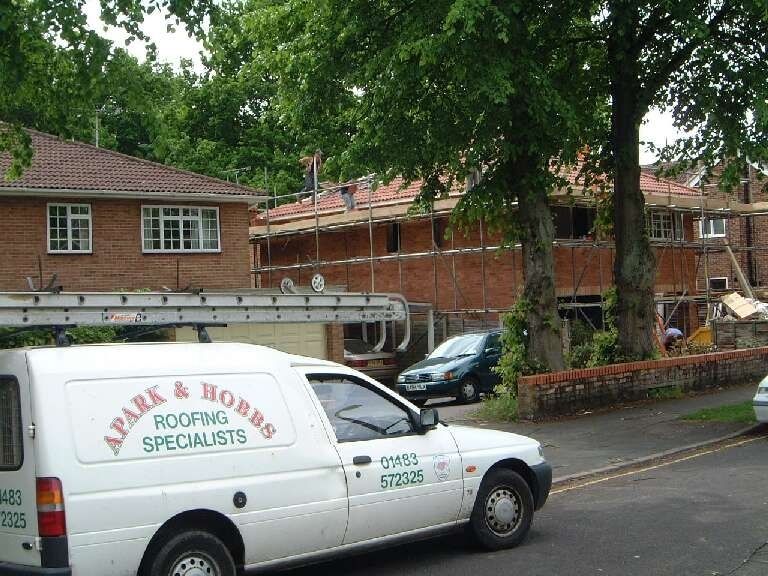 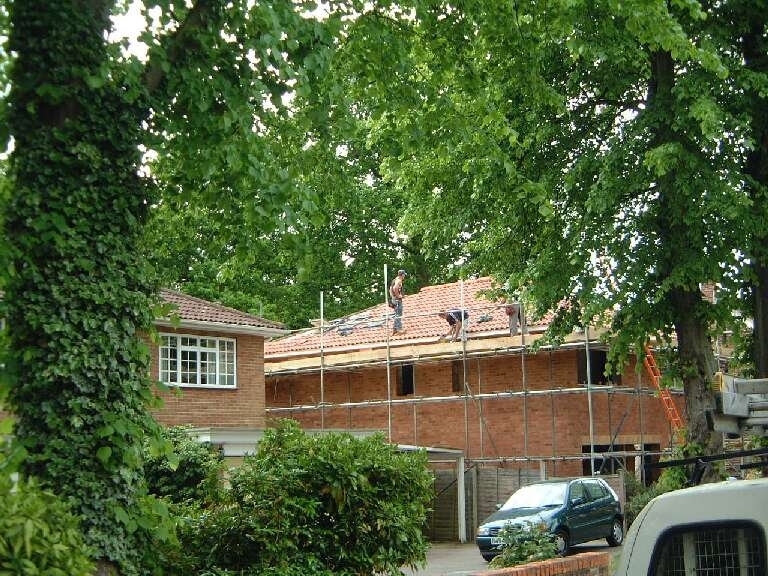 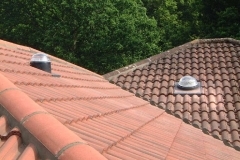 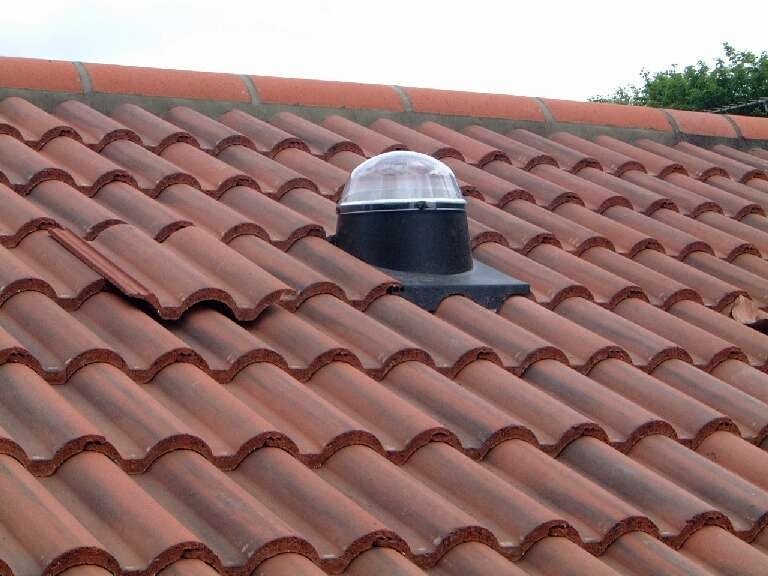 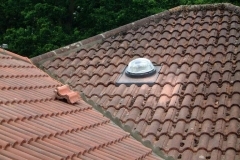 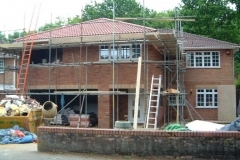 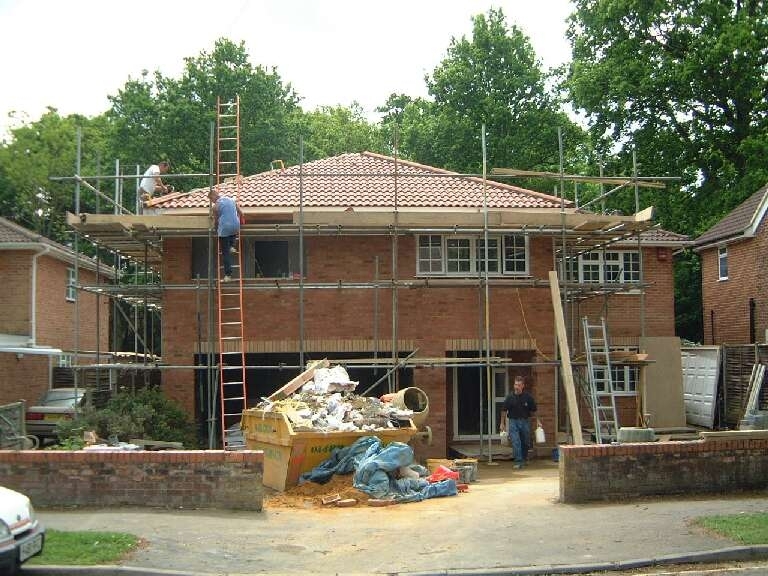 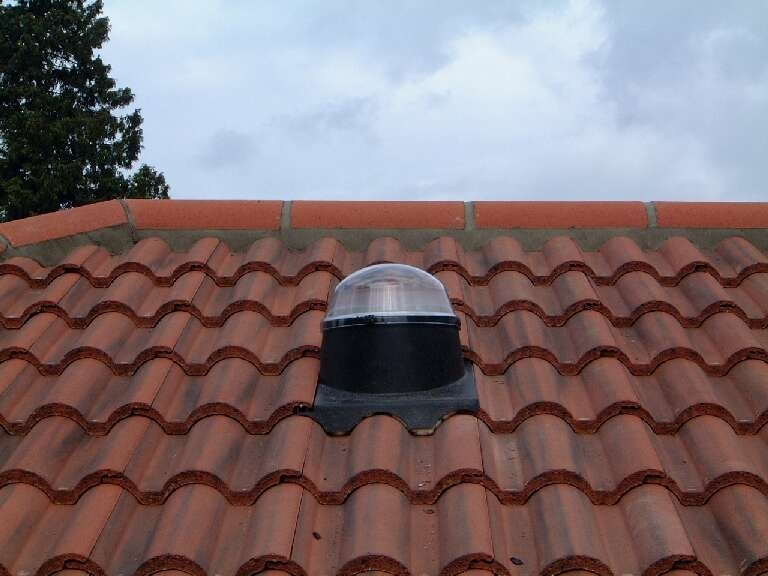 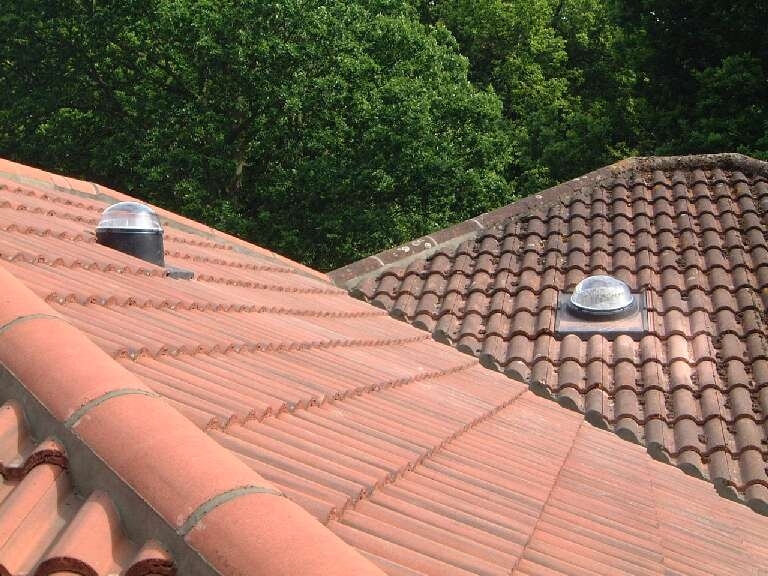 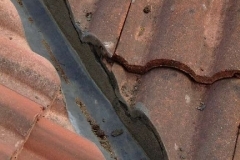 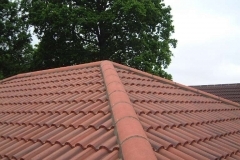 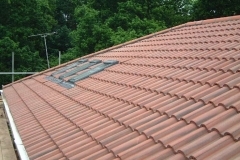 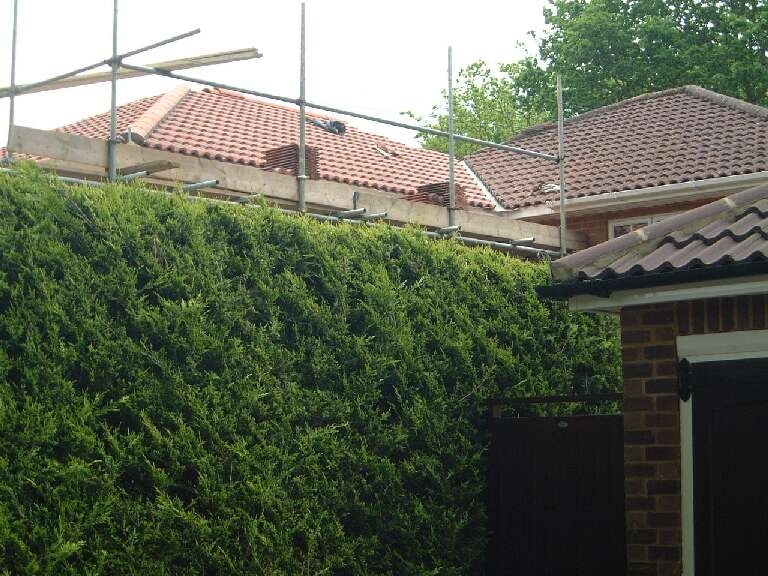 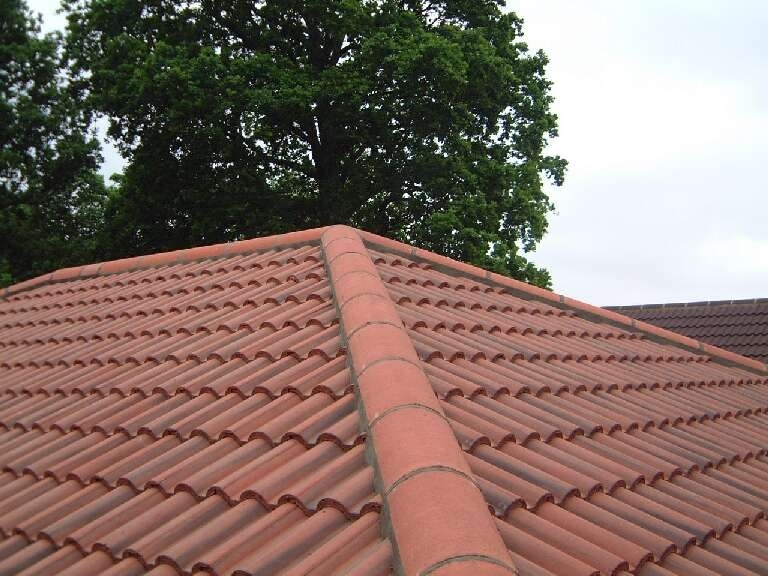 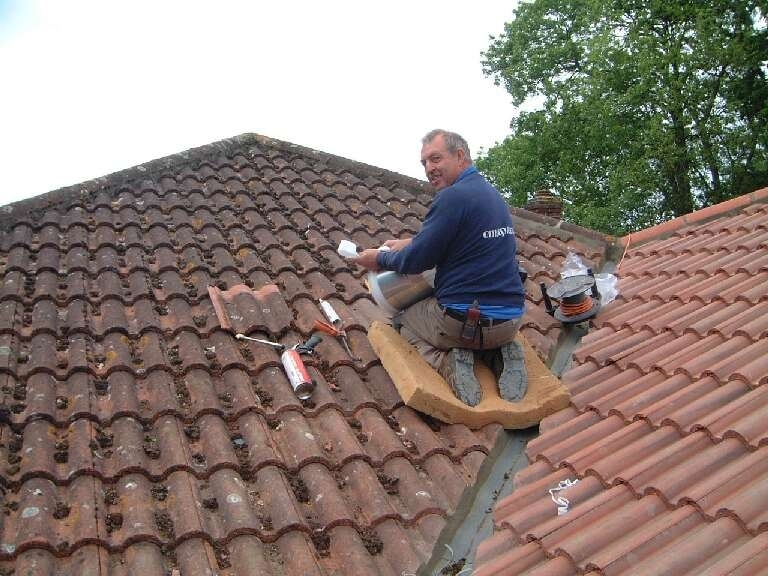 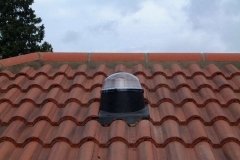 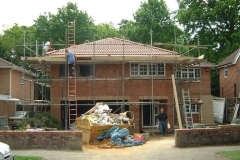 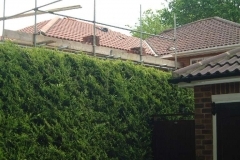 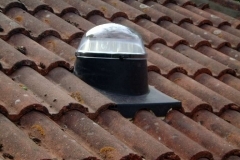 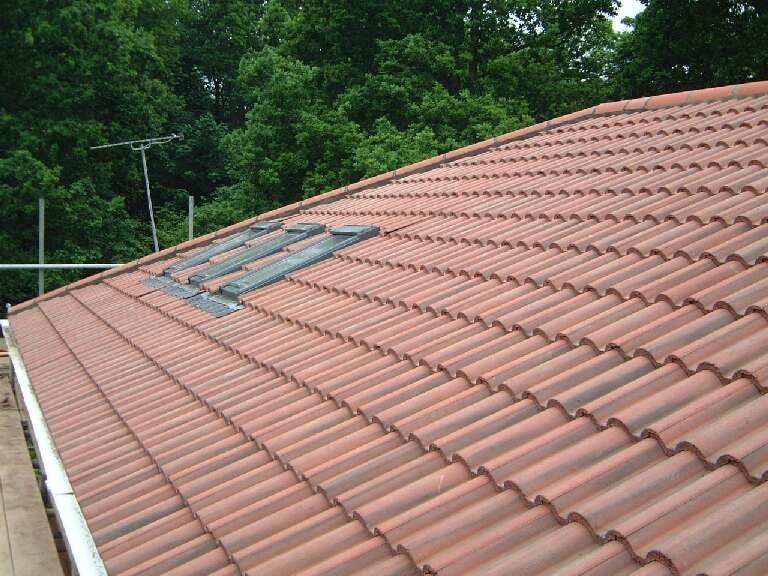 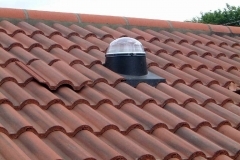 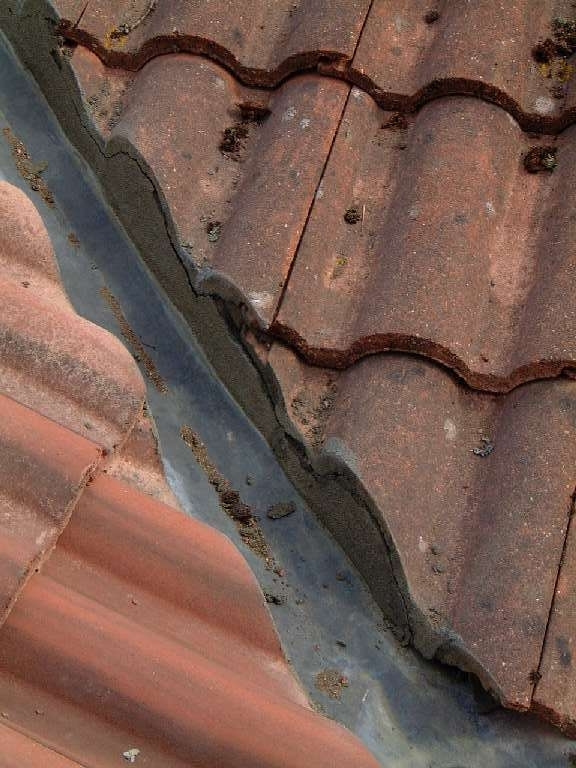 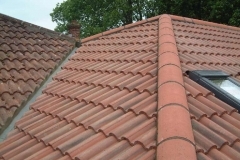 Day 44 – 19-05-03 Ridge tiles were of the wrong type so Bill went off to get them changed. 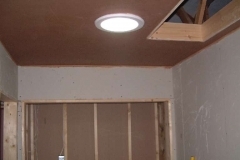 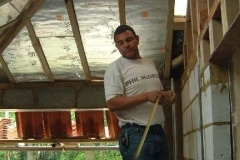 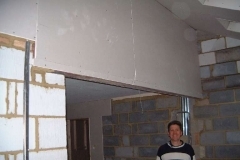 Phil & Paul were putting the plasterboard up to provide the ceiling upstairs which they achieved. 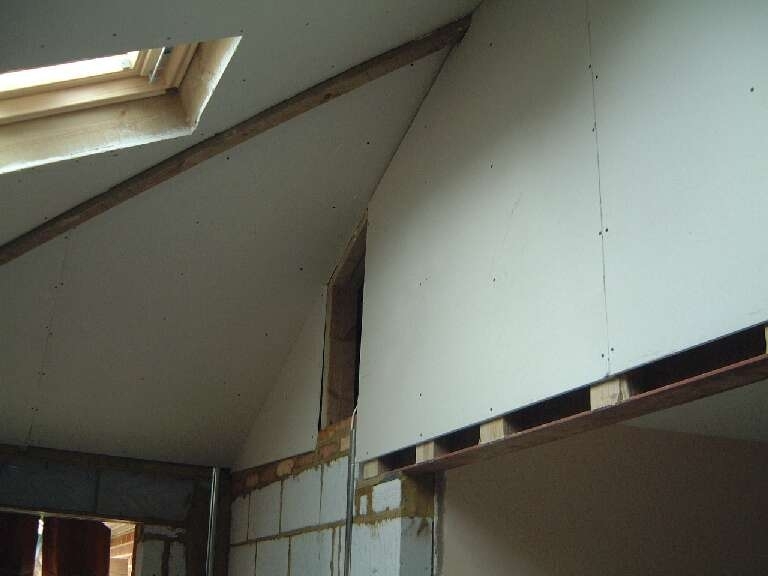 Bill finished off the rest of the plasterboard work upstairs so the the plasterer would be able to work cover a large area. 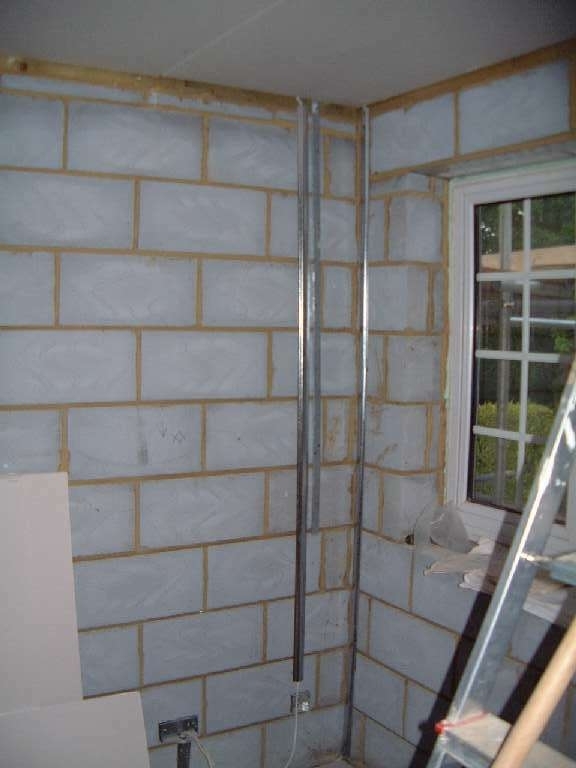 The plasterboard & plastering however can not be done in the master bathroom and the en-suite due to the plumbing needing to be sorted. 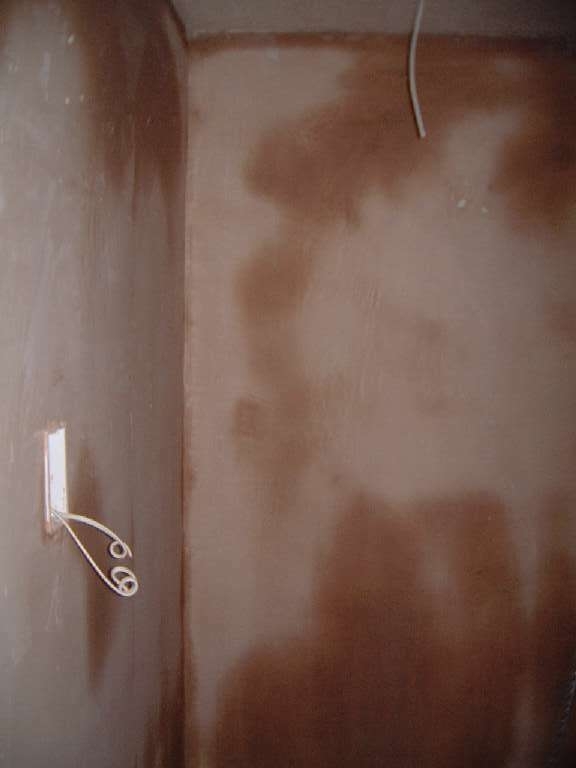 I installed data/telephone points in the master, bedroom 3 and bedroom 3 dressing room. 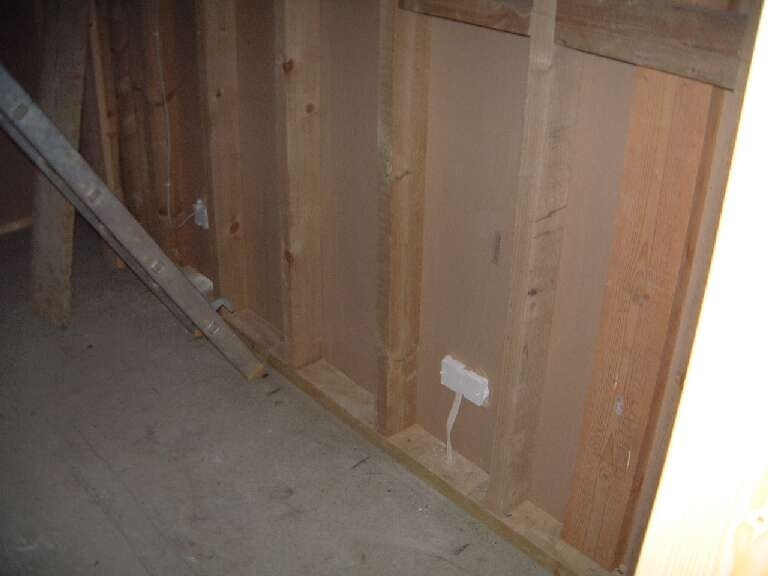 Also installed TV cable in the two bedrooms. 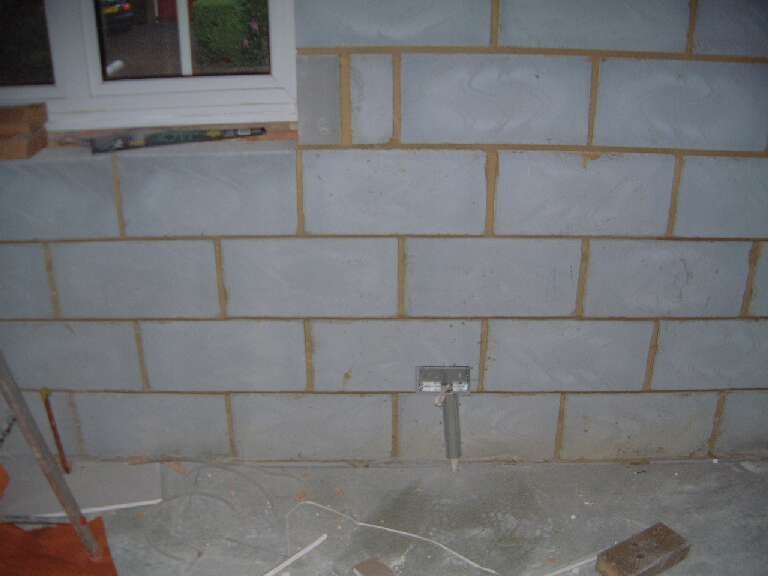 Further cable has been put in place for 5 PIRs plus keypad, the porch camera and back/front doorbells. 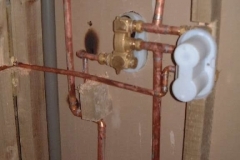 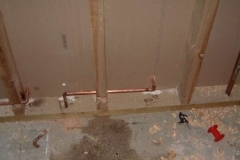 Ashford Plumbing delivered all of the sanitary ware. 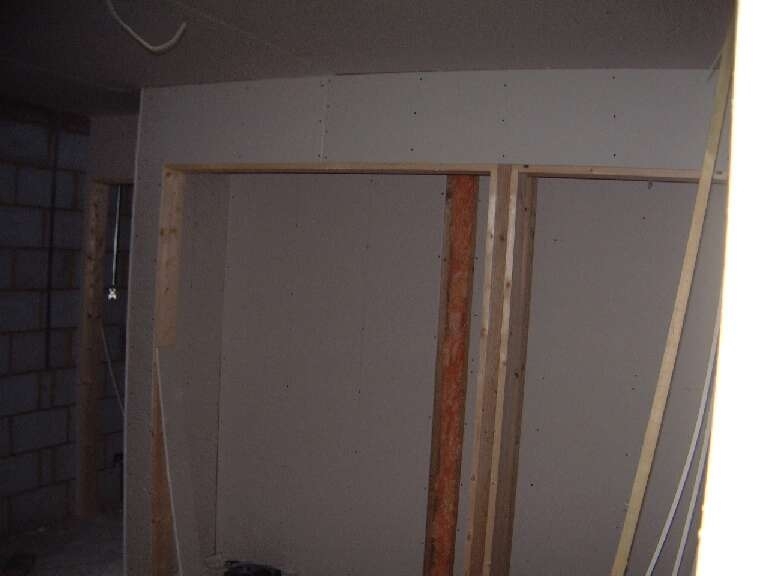 Day 45 – 20-05-03 Showers. 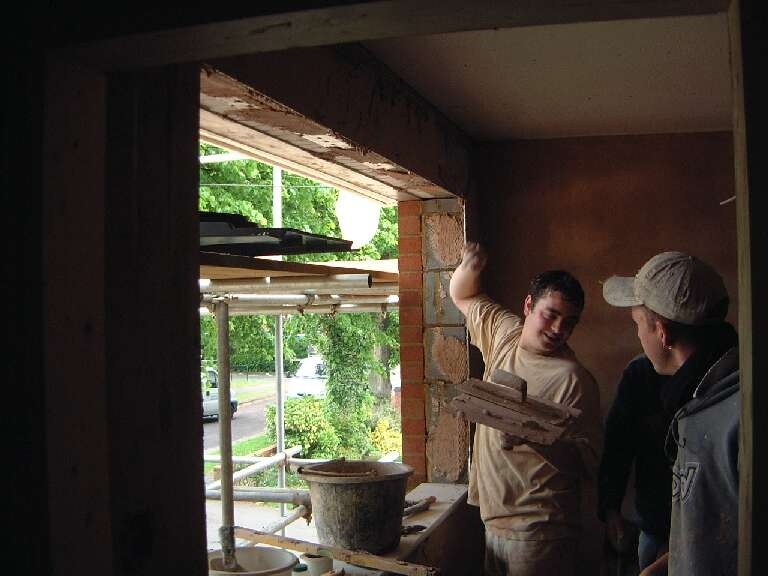 Bill, Phil & Paul had to go over to their previous job in St. Johns as the customer was getting flooded due to the heavy rain. 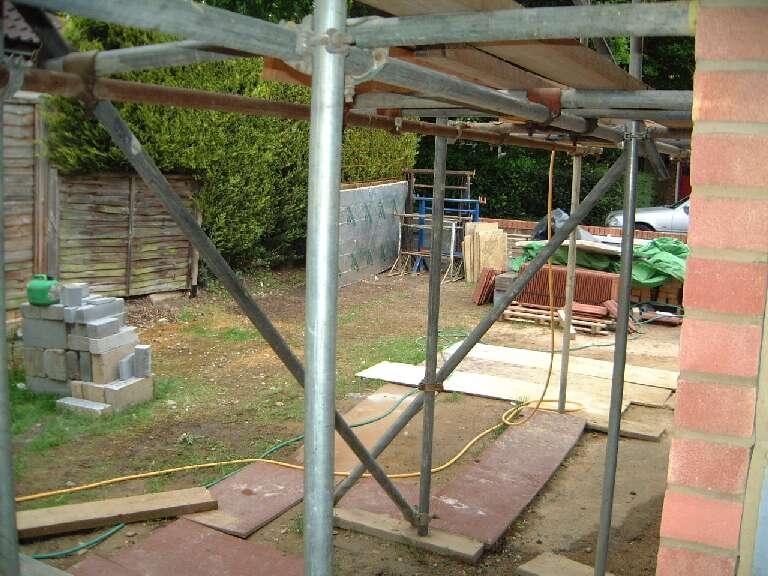 This left John on his own to complete the brickwork above the old entrance. 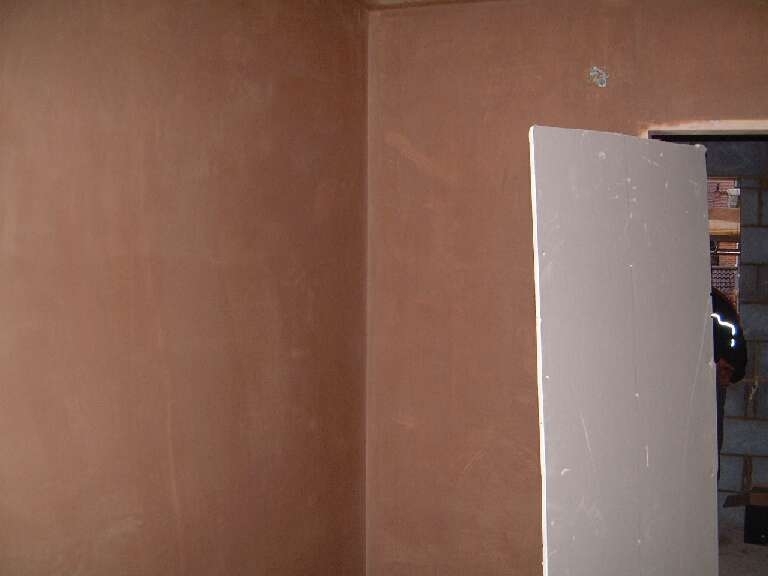 We were expecting the chippies but no one else turned up. 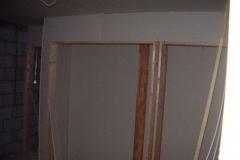 Very little got done today. 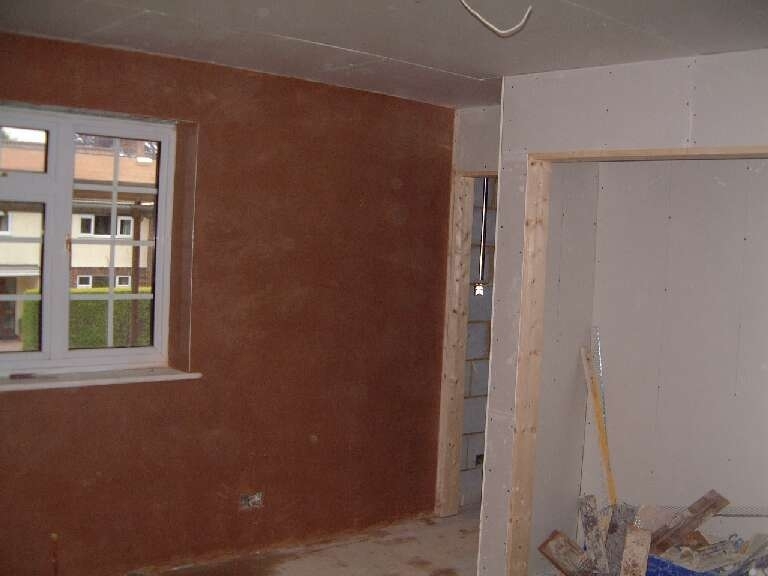 Day 46 – 21-05-03 Fine. 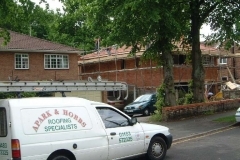 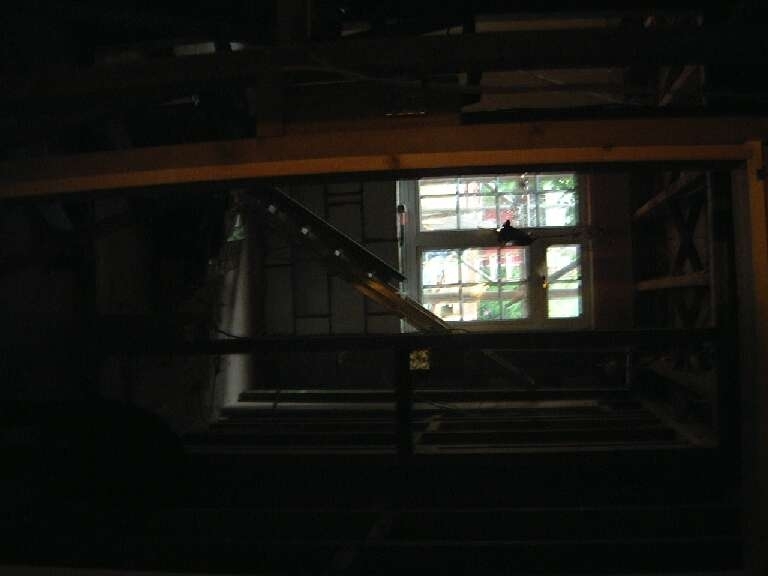 Yesterday was very quiet and today it was the busiest day yet – 4 roofers, 5 builders, 4 plasterers 1 chippy and 1 electrician. 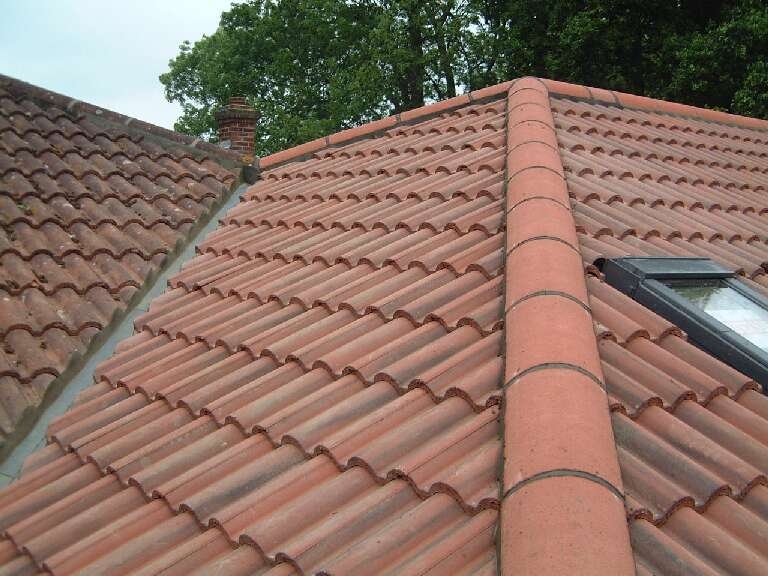 The roofers have been cementing the ridge tiles and they look very good. 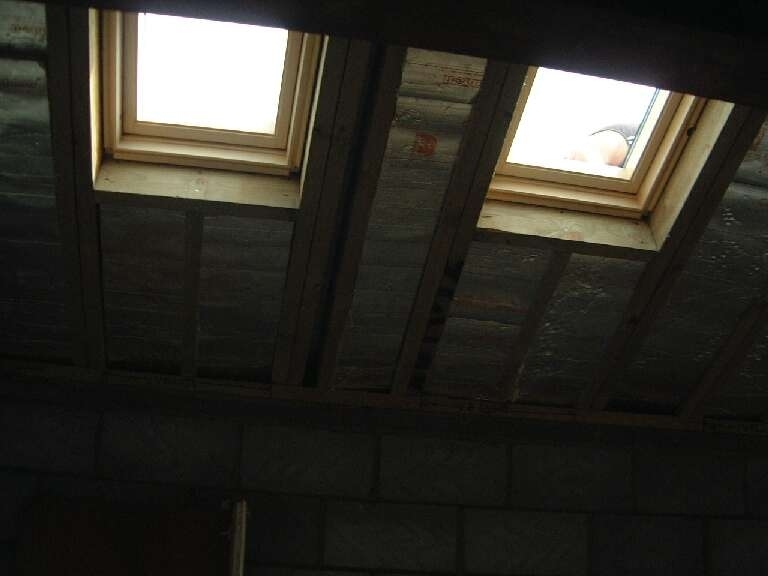 The other 2 velux windows were installed. 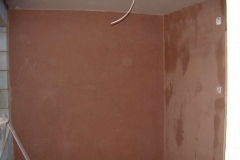 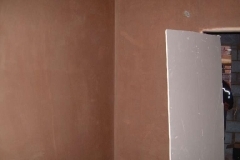 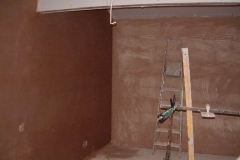 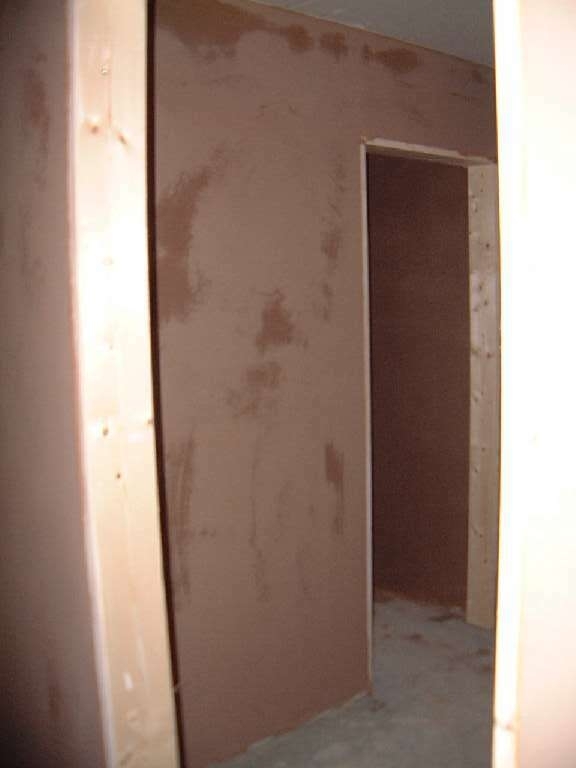 The plastering was done in bedroom 3, dressing room and en-suite with the quality looking extremely good. 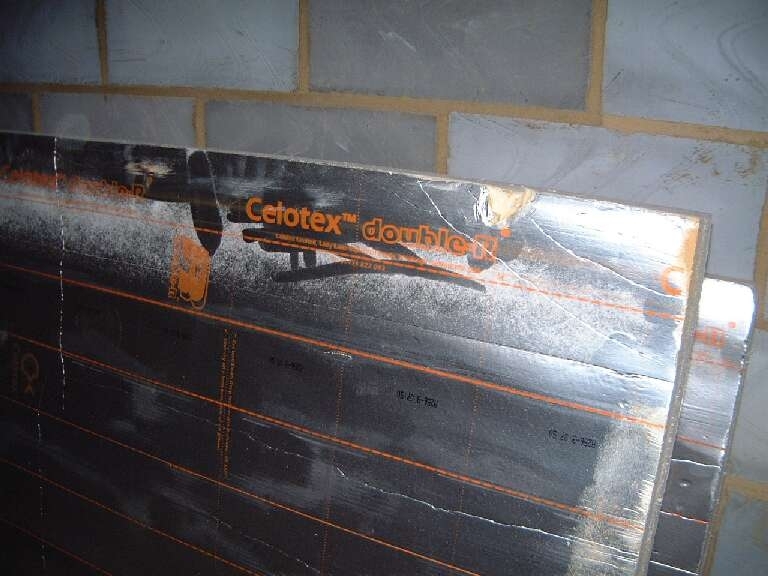 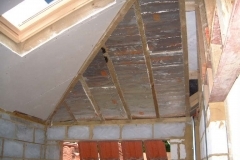 The celotex was put into cathedral roof and plaster board placed over it. 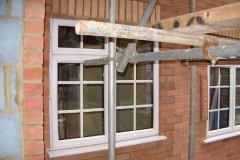 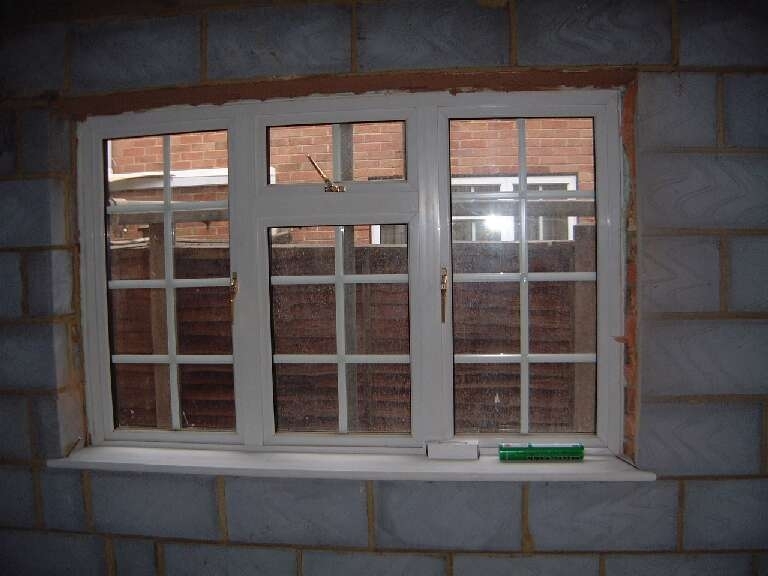 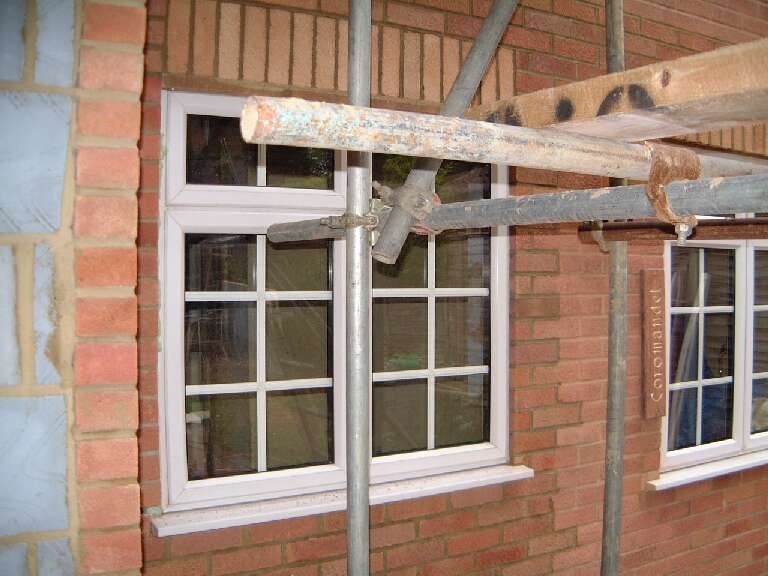 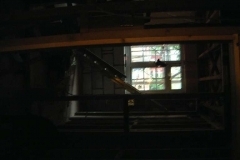 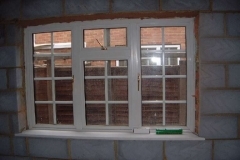 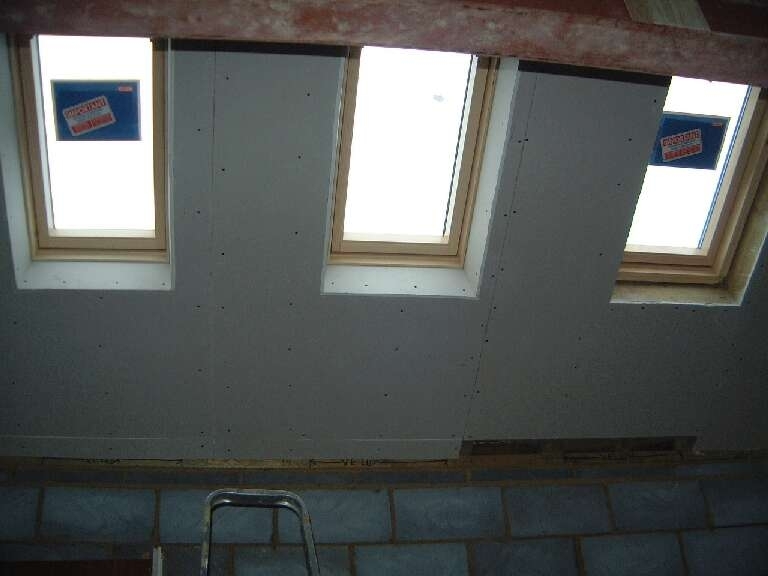 The landing window has been partially cutout and window sills have been put in. 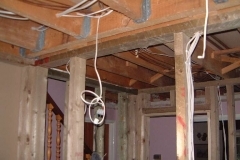 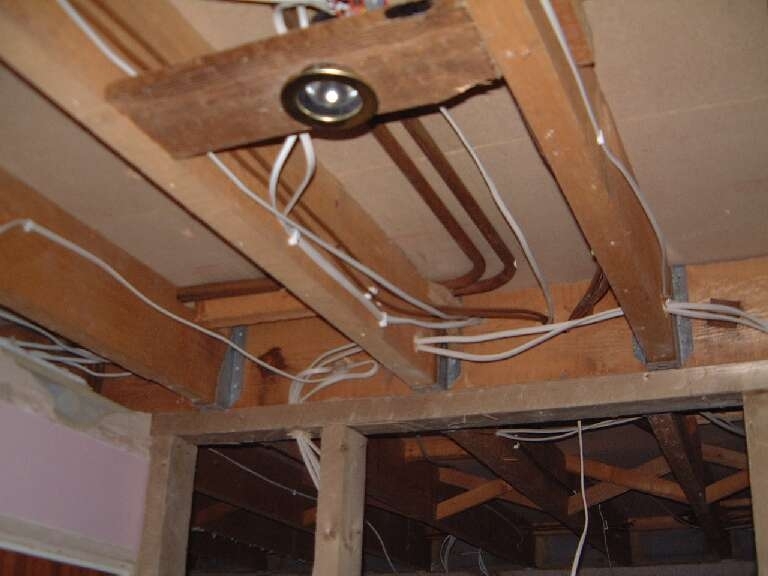 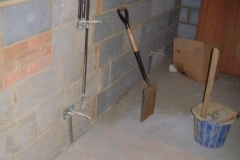 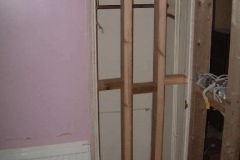 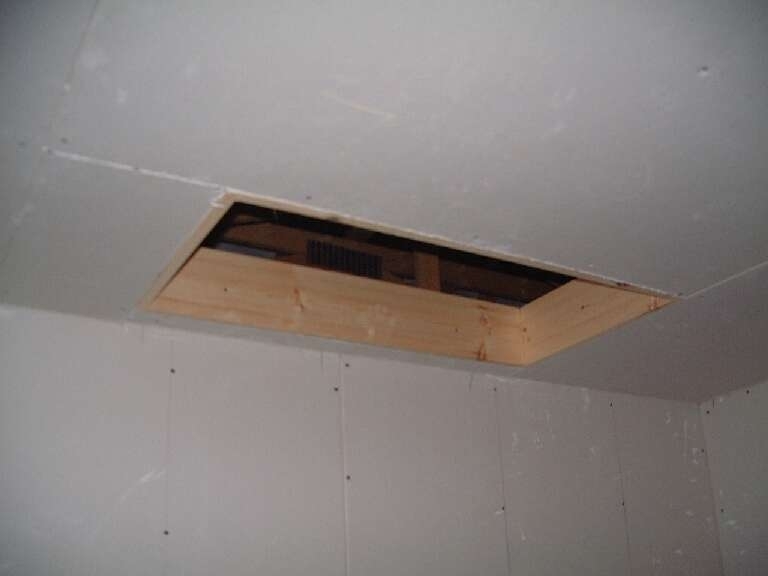 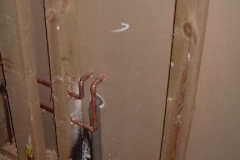 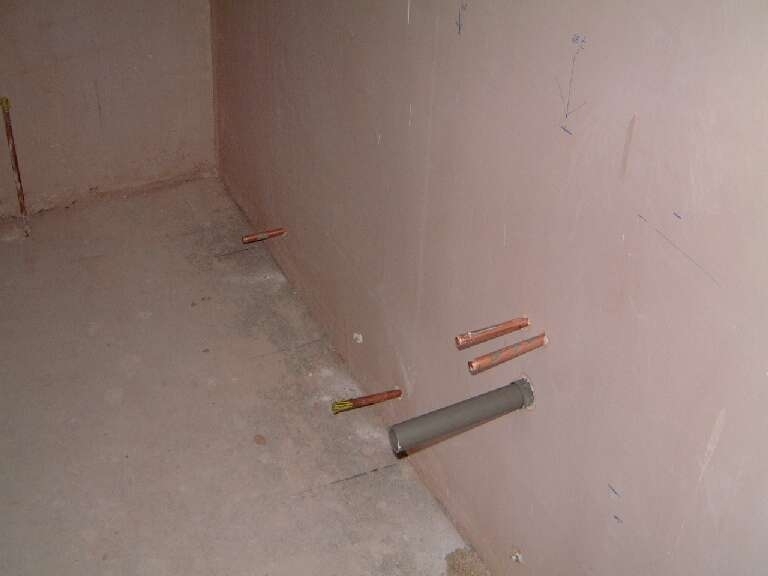 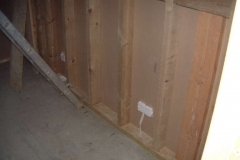 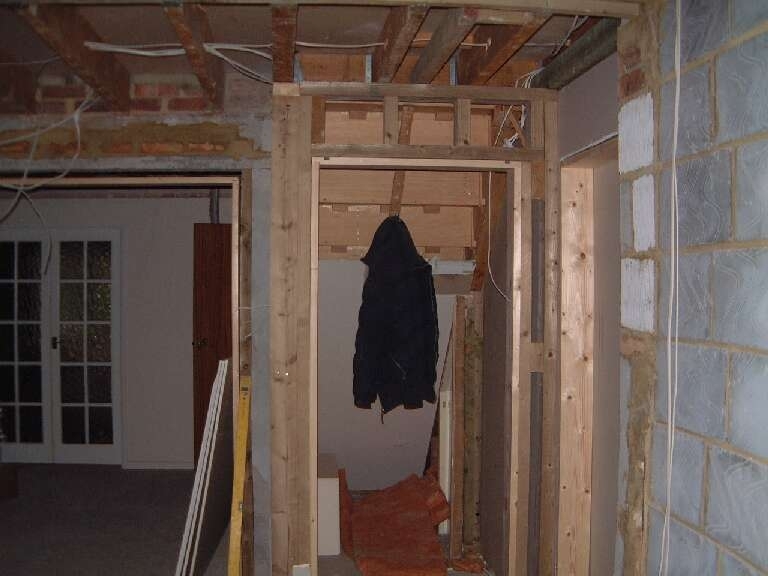 The chippie built the loft trap and also stud work boxing in the soil pipe in the dining room and the coat cupboard. 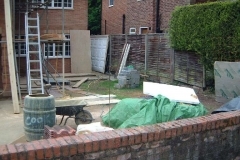 The garden has also started to be cleared and Bill estimates less than 3 weeks further work. 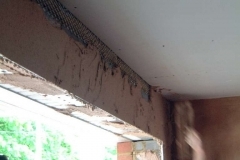 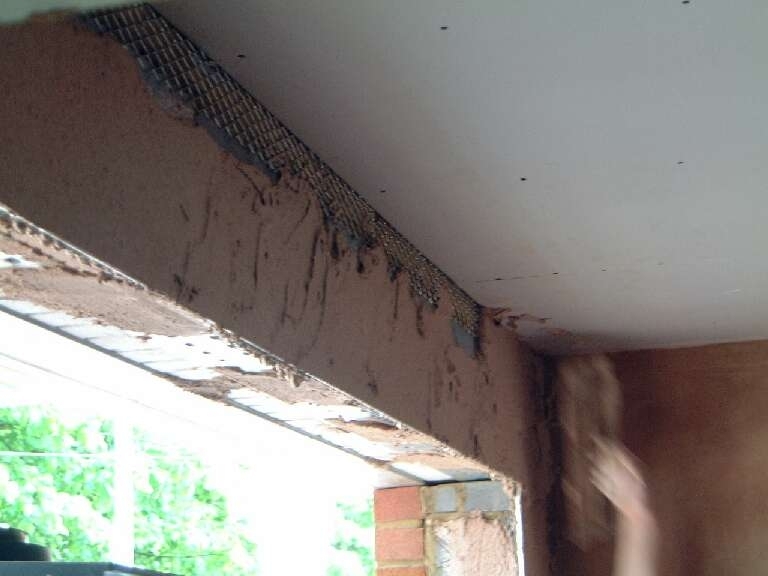 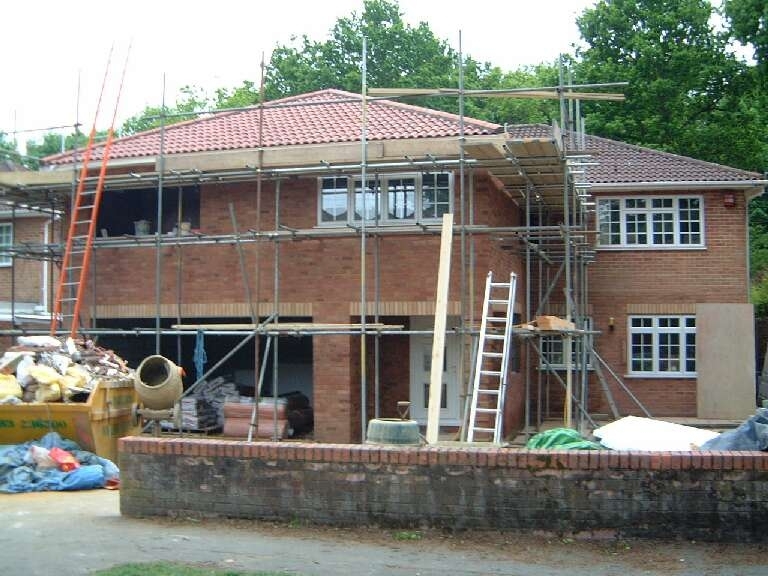 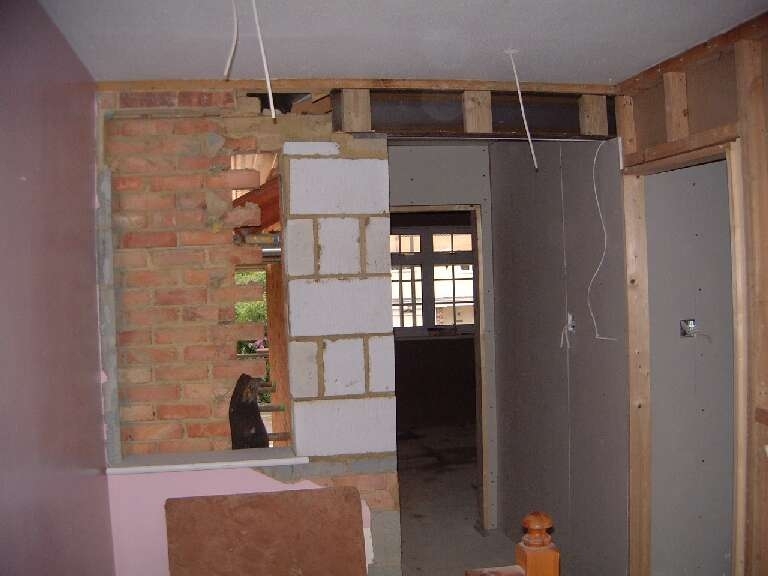 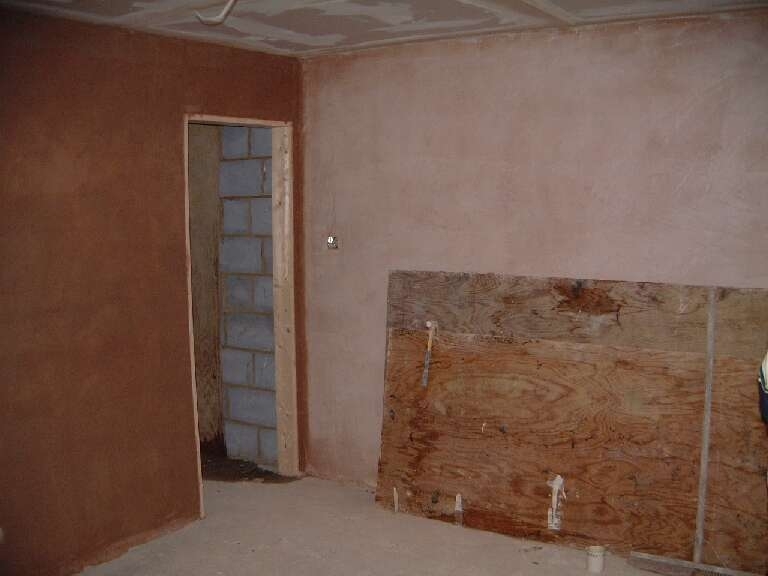 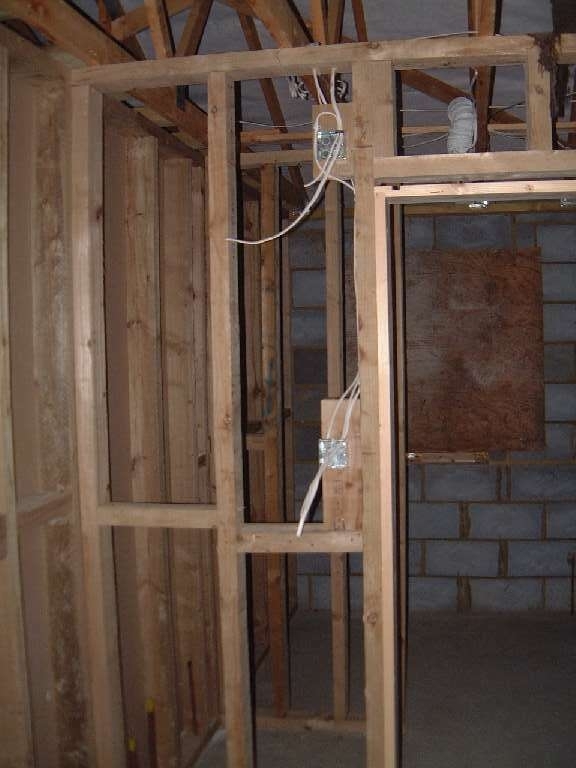 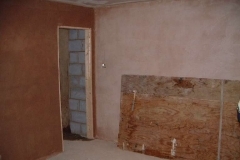 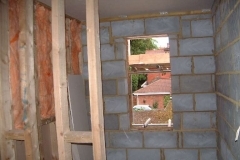 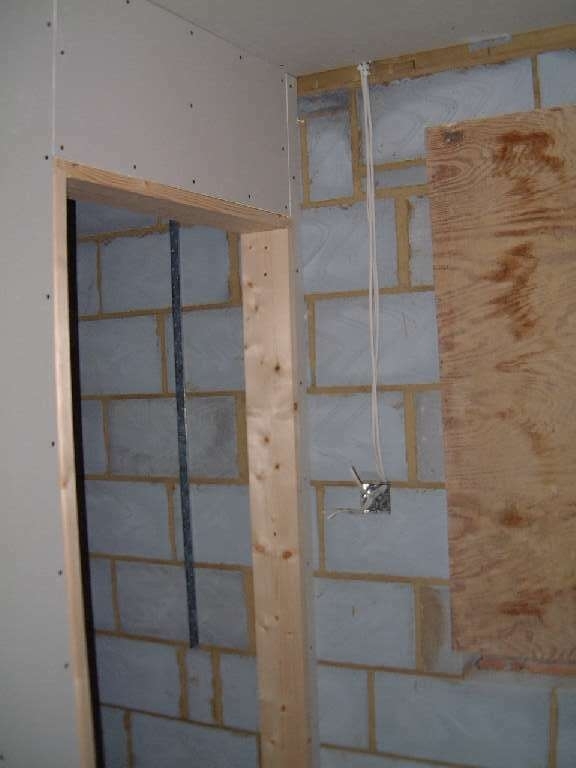 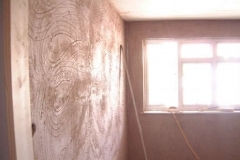 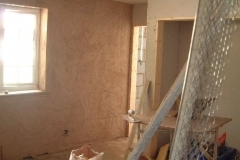 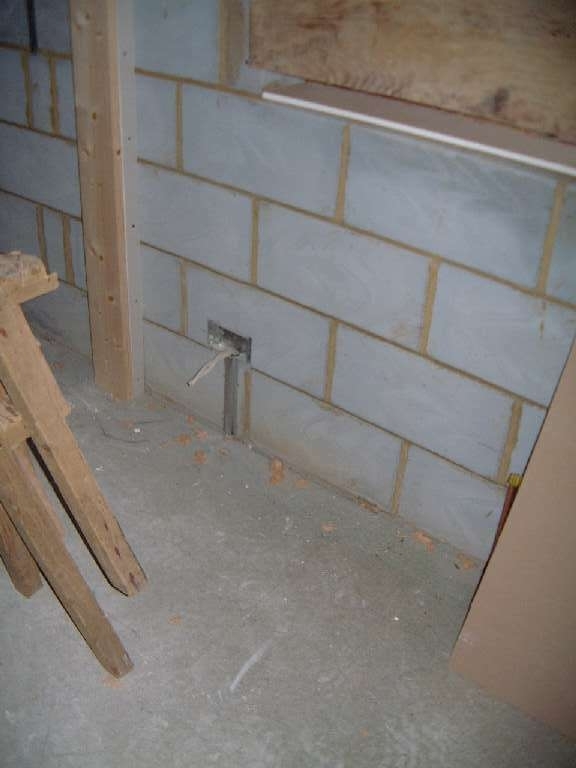 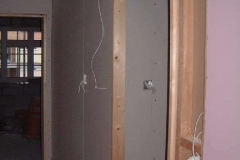 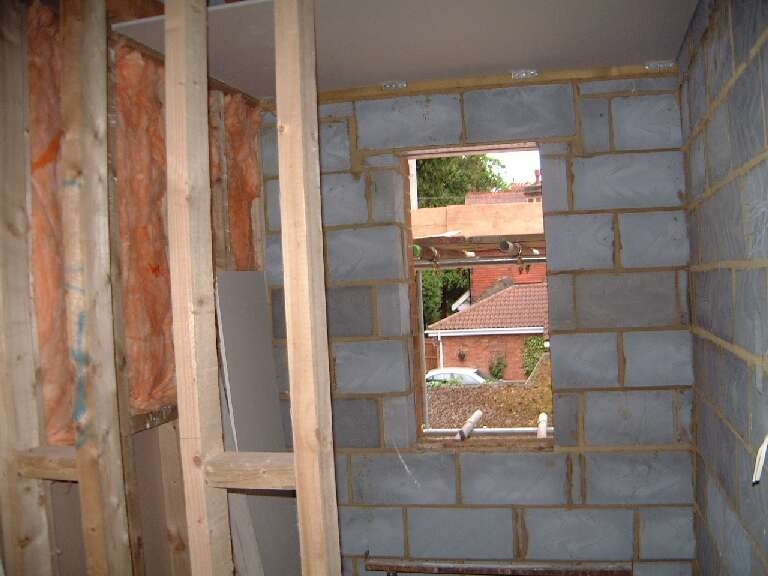 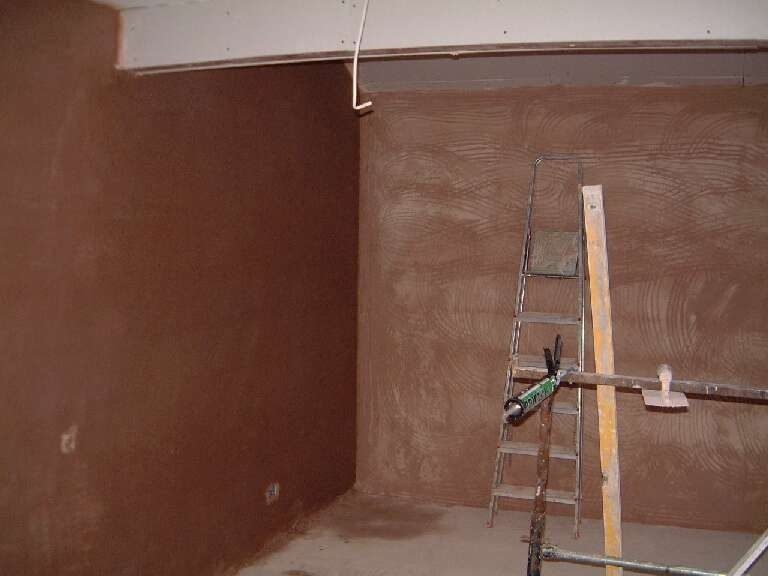 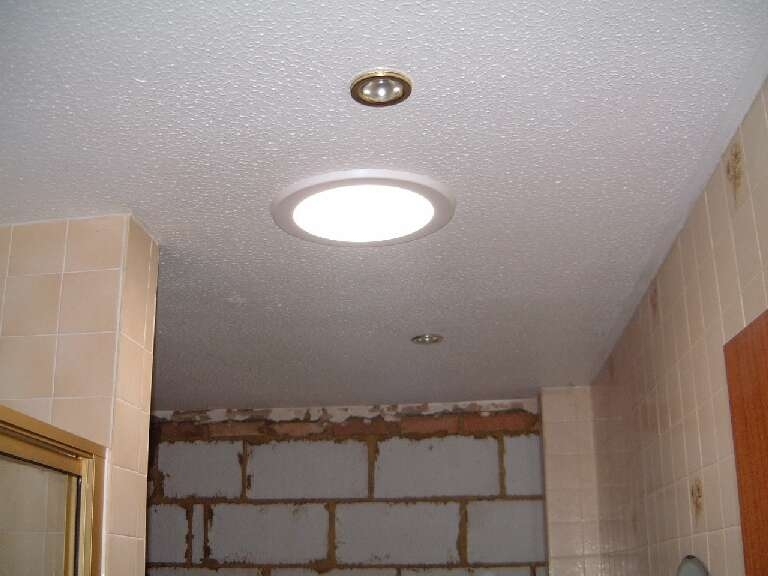 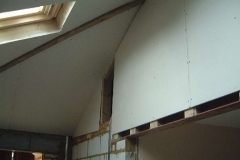 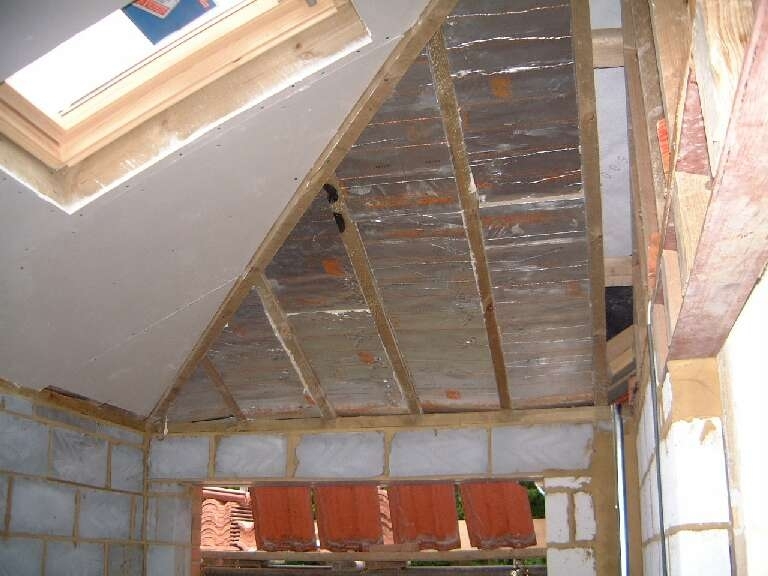 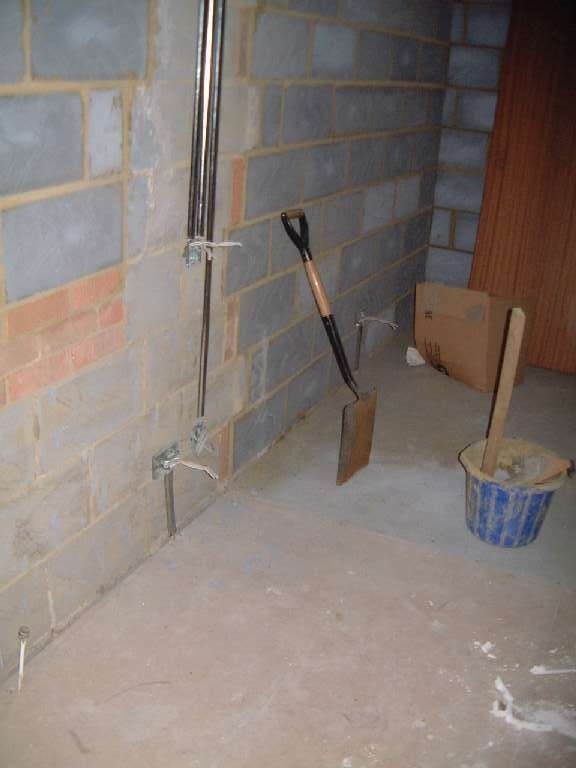 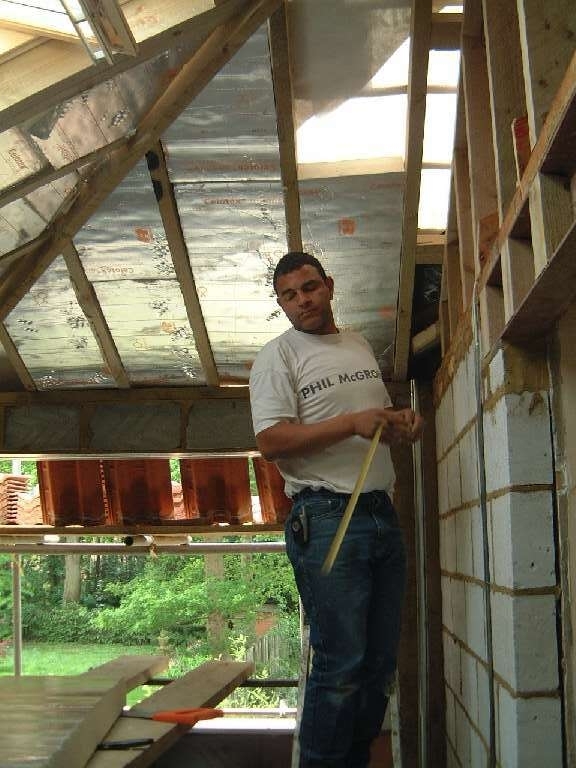 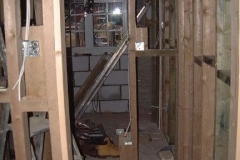 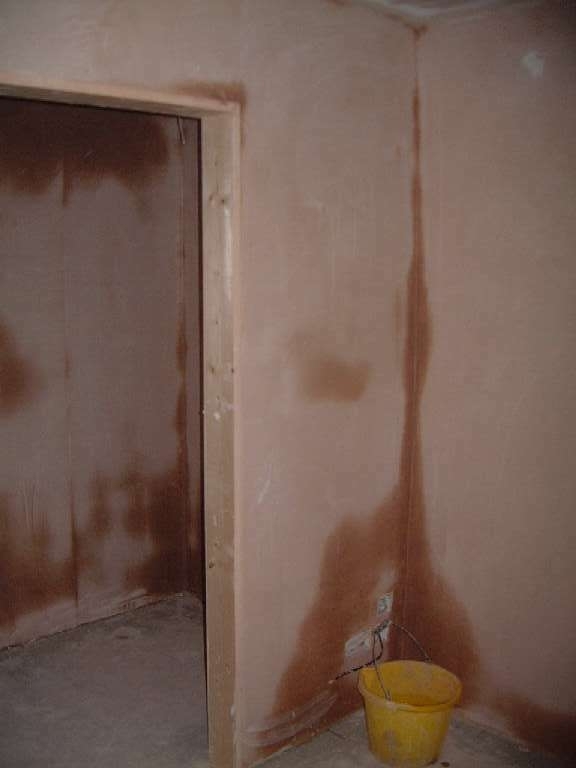 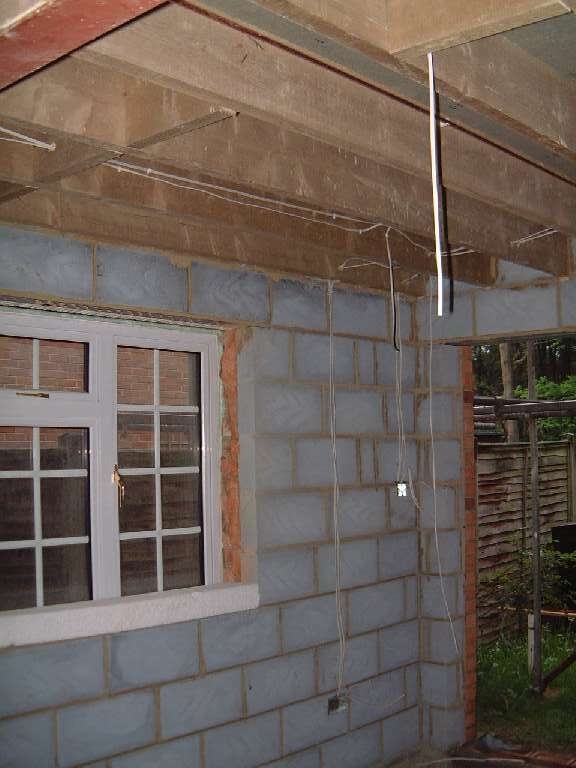 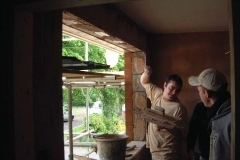 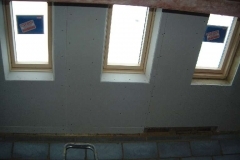 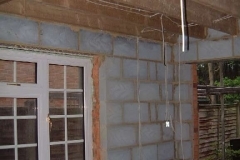 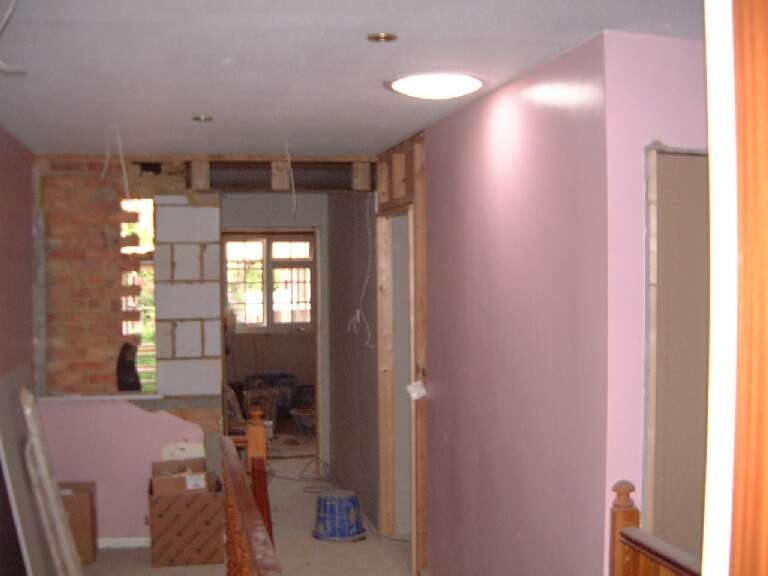 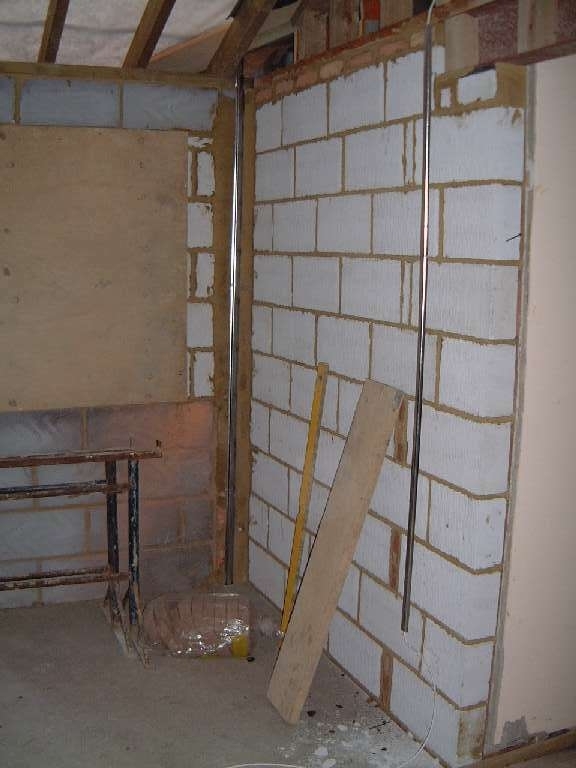 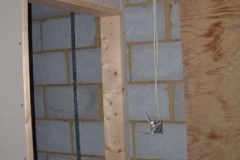 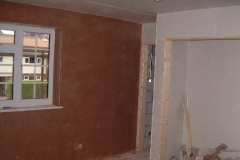 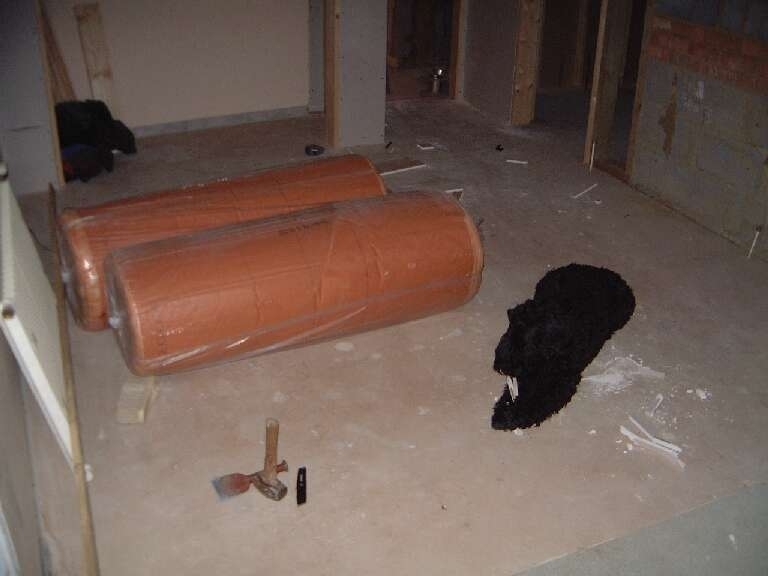 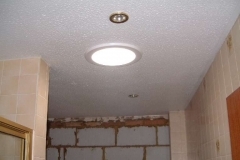 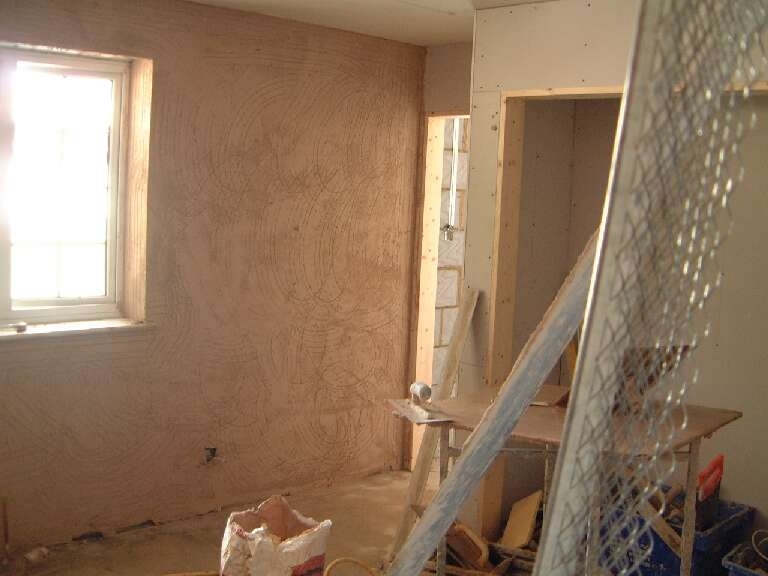 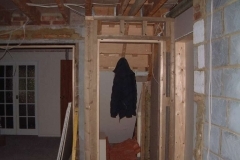 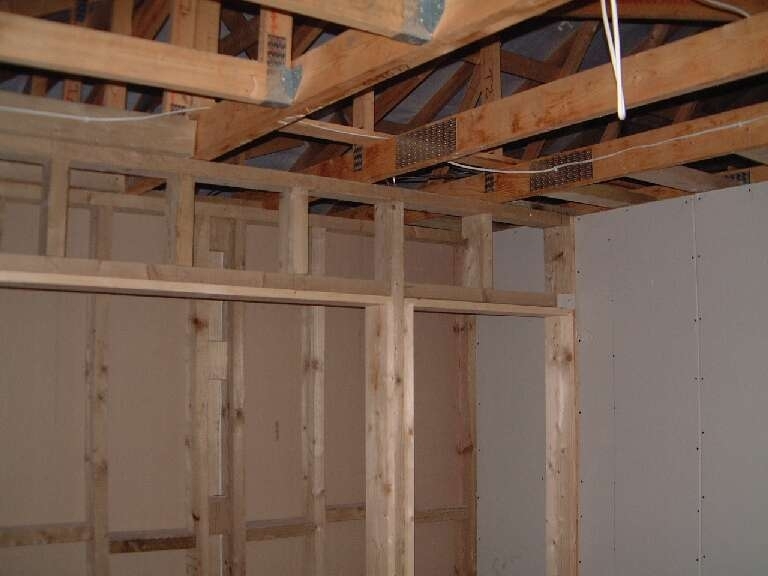 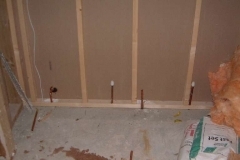 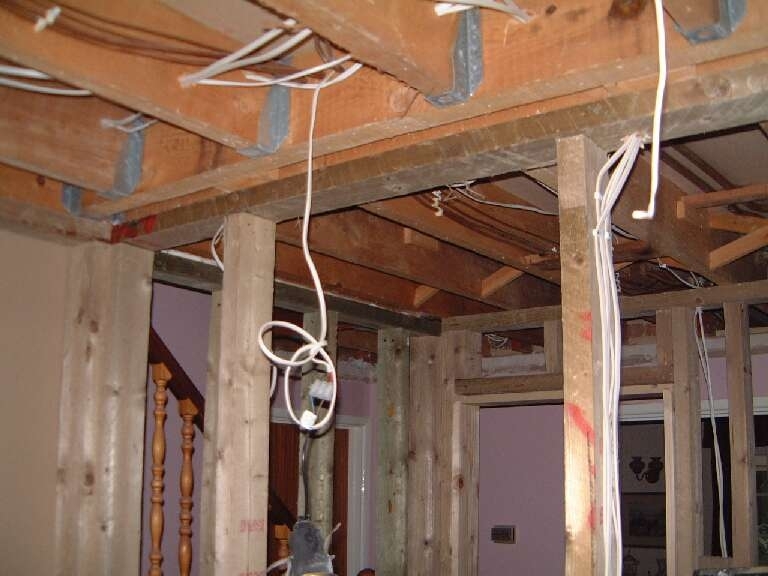 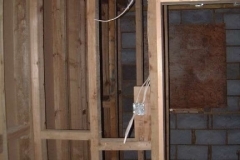 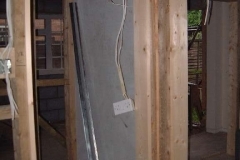 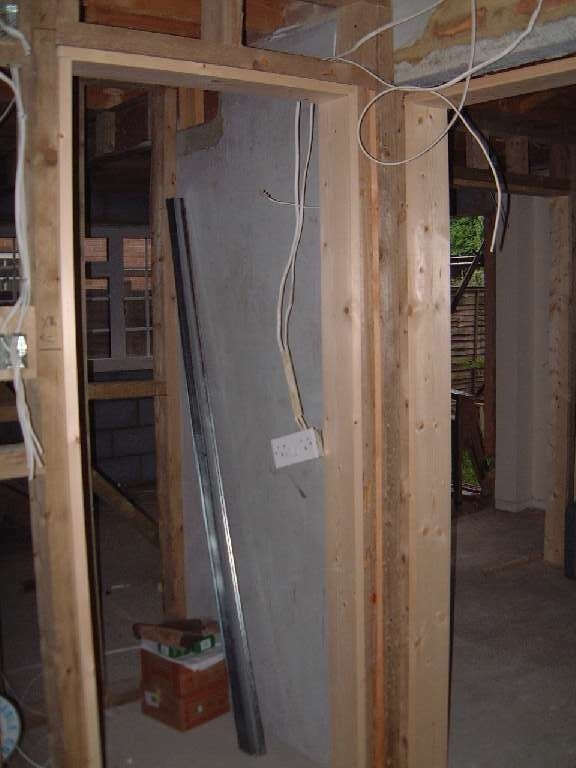 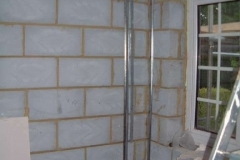 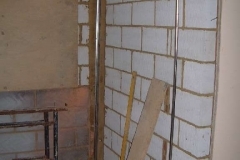 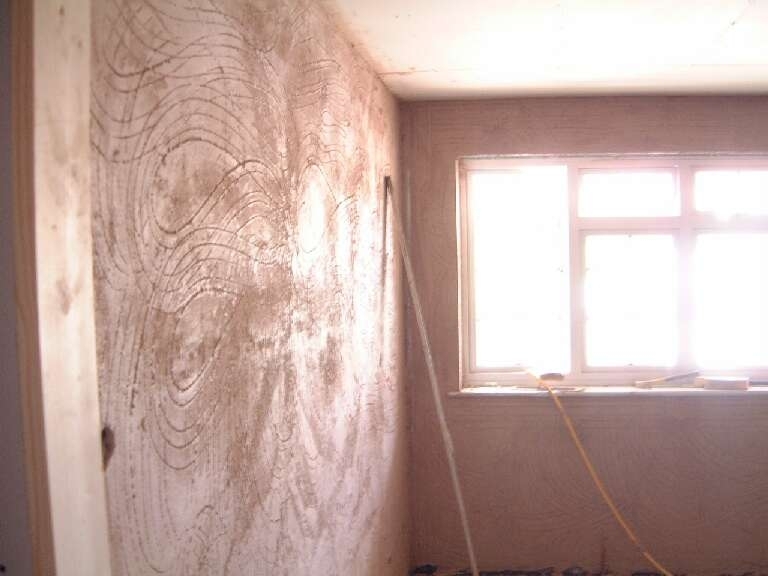 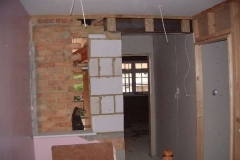 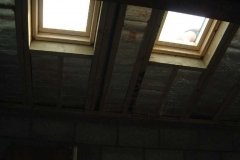 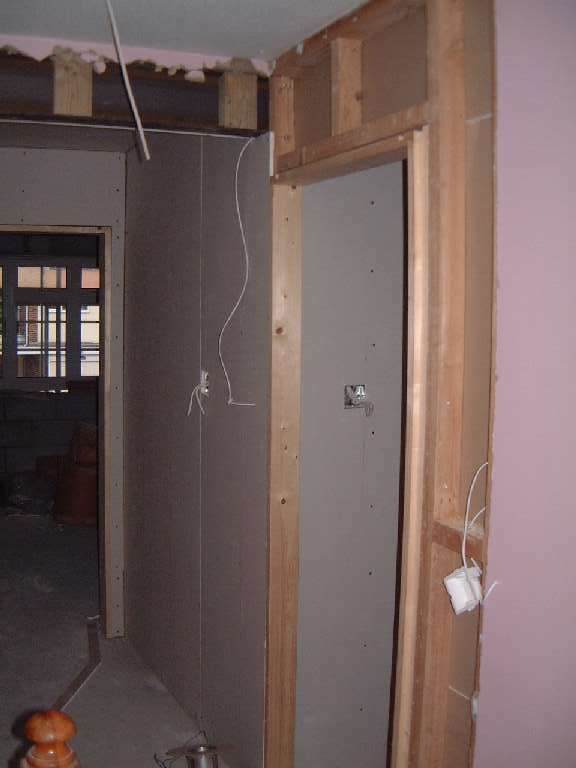 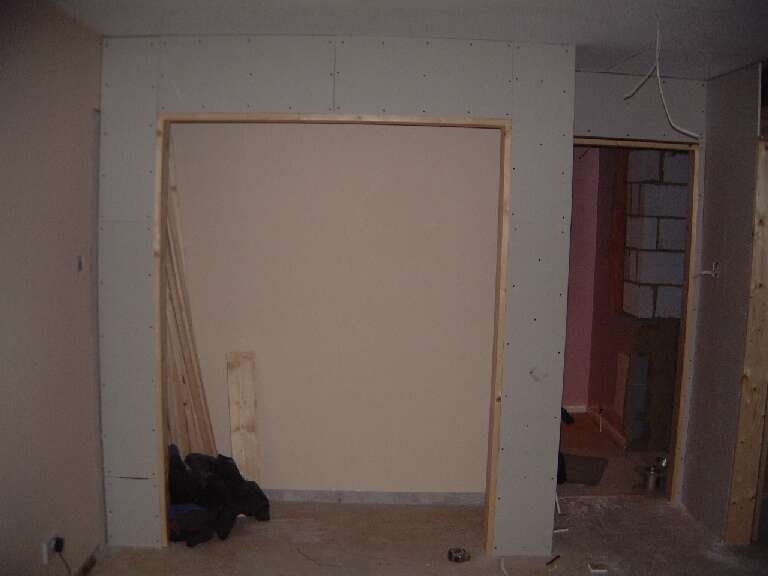 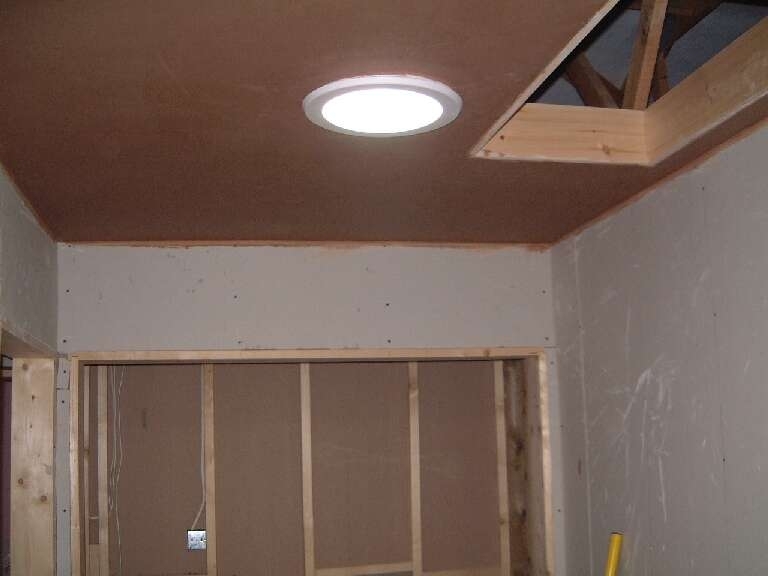 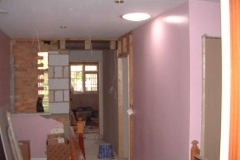 Day 47 – 22-05-03 Plastering of front rooms, plasterboard put in gallery ceiling and also in dining room. 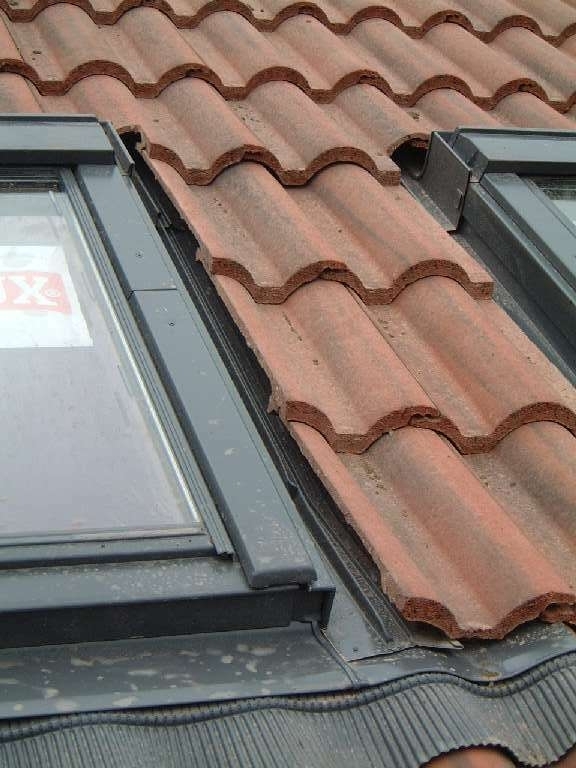 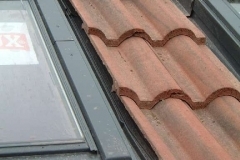 Velux windows really work well however we have noticed that the tiles surrounding windows have not been cemented therefore leaving the roof open to birds etc. 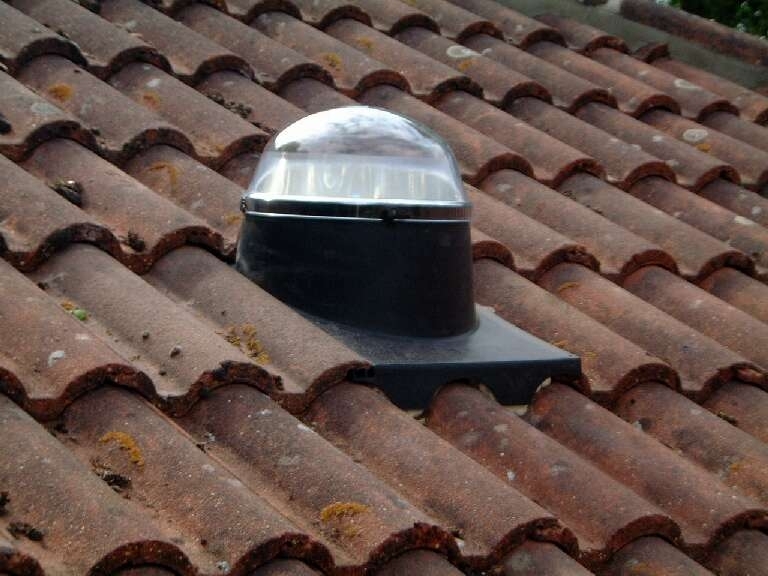 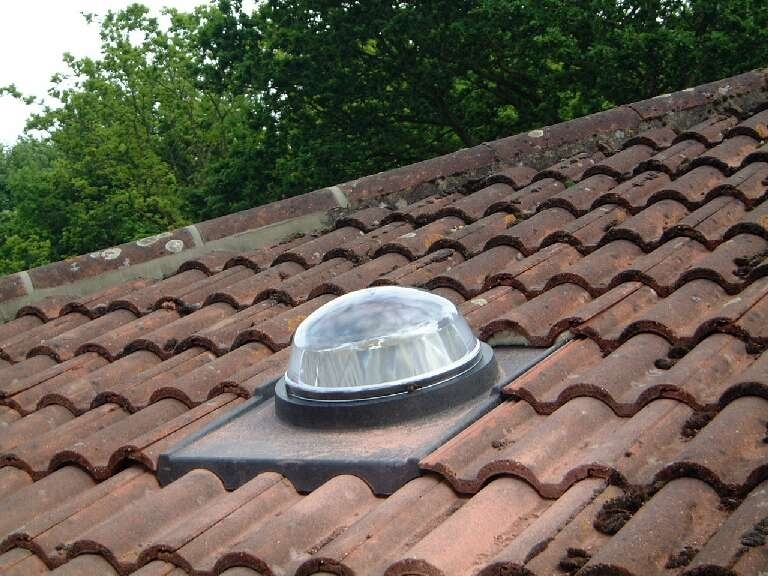 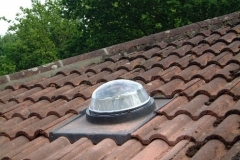 Day 48 – 23-05-03 Decided to get solar tubes installed by recommended installer from Solartube – total cost £300. 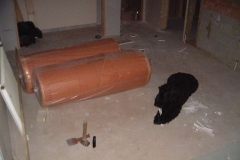 Installer arrived at 7:30 and finished at about 15:00. 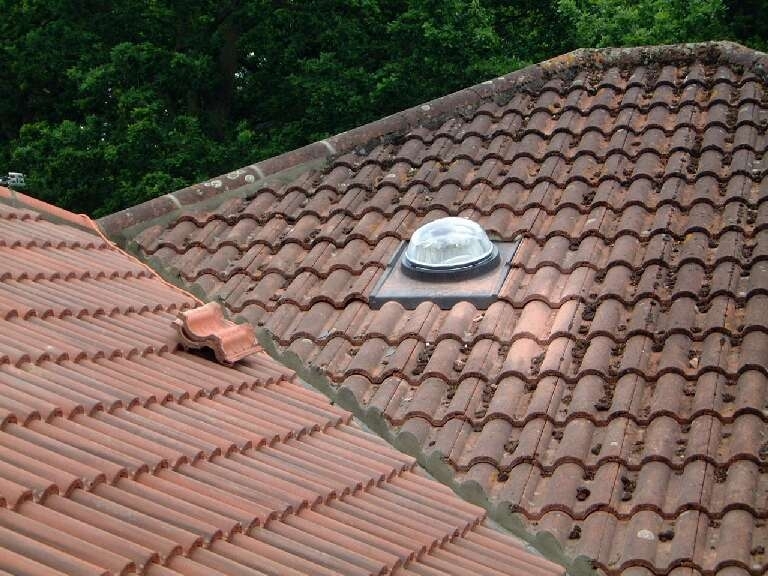 The effect is quite dramatic and the domes look rather si-fi. 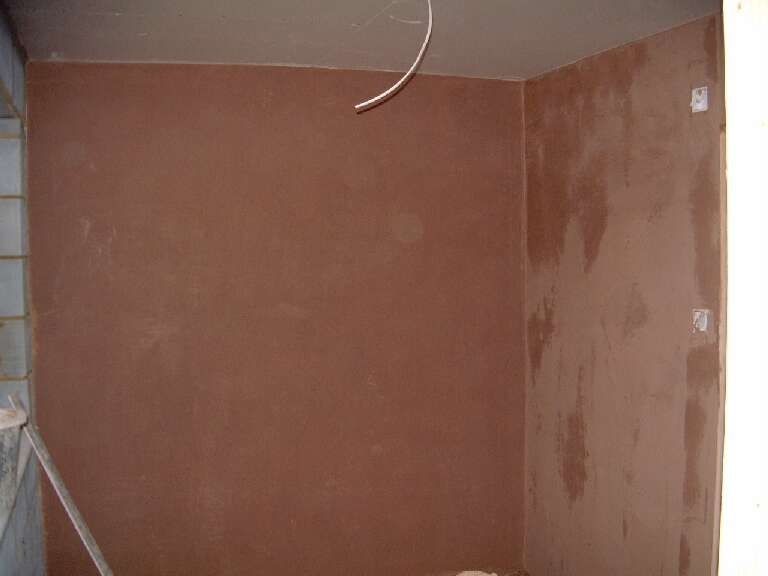 Plastering started in Master bedroom. 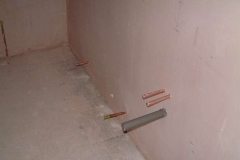 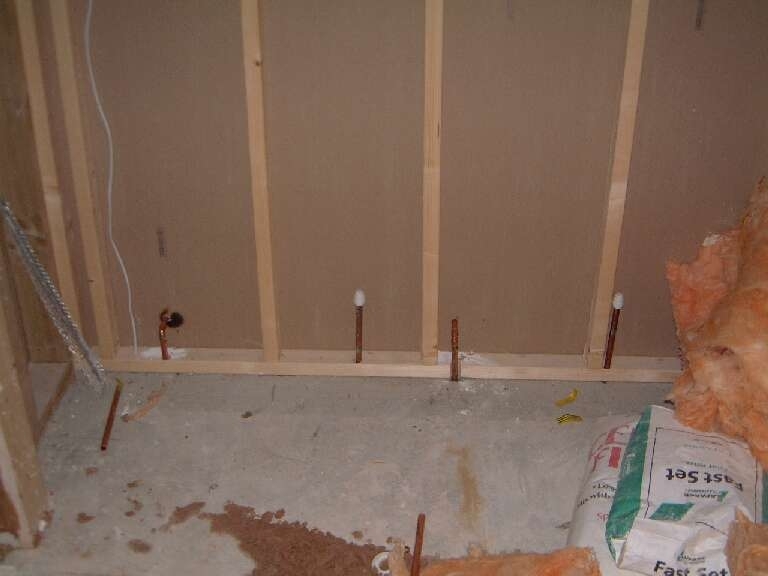 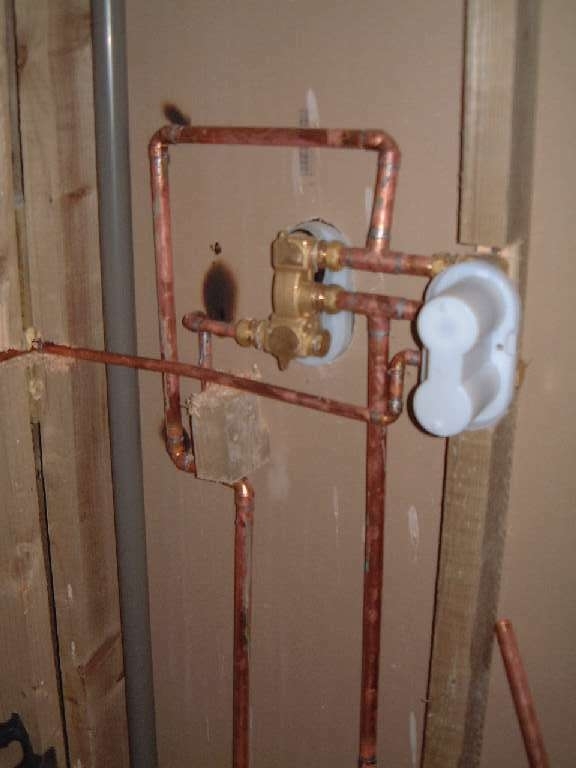 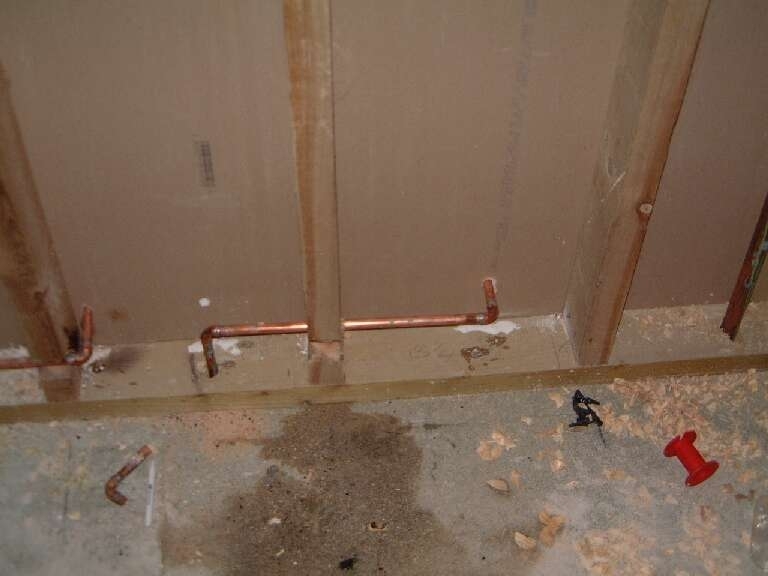 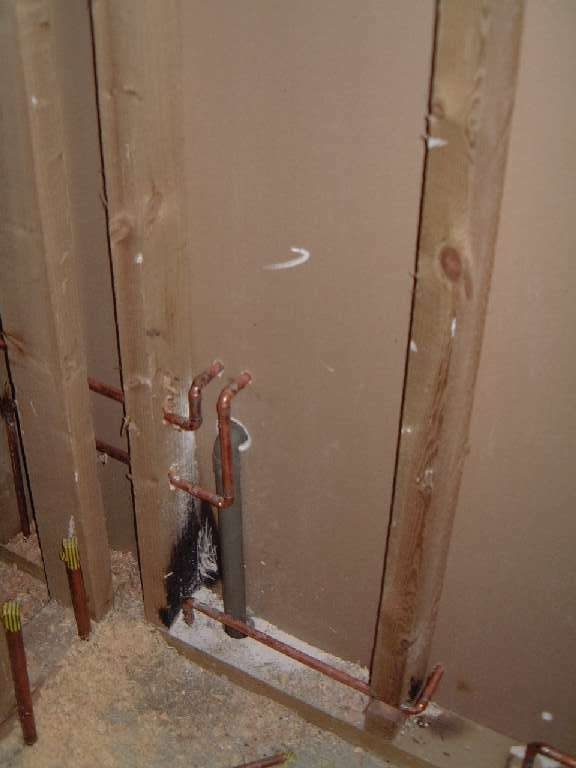 Day 49 – 24-05-03 Plumber worked in bathrooms connecting showers, moving radiator in master dressing room. 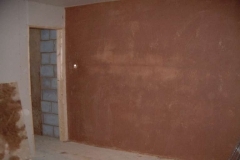 Plaster ‘finished’ a wall in the master bedroom.